'What words adequately express the pain and suffering of 50 men, women and children lost, and so many injured?' asked New Zealand prime minister Jacinda Ardern during her address at a memorial service for the Christchurch victims. She says those words 'have left us humbled, and they have left us united. Adern was speaking at the National Remembrance Service in North Hagley Park in Christchurch, New Zealand to remember the 50 people killed in the Christchurch mosque shootings on 15 March. Now I've been crying lately, Thinkin' about the world as it is. Why must we go on hating, Why can't we live in bliss? Yusuf / Cat Stevens performs Peace Train at the national remembrance service for the victims of the Christchurch mosque terror attack. This is the mosque in New Zealand in which over 40 people were murdered by a terrorist. 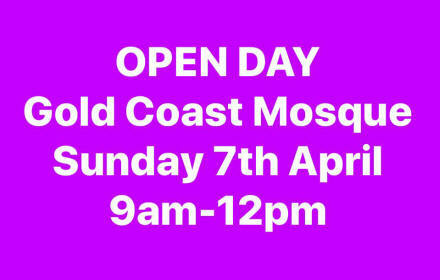 Today the mosque was opened up to the community where hundreds of non-Muslims came to visit. In this video, John Fontain from England can be seen educating people about what Islam really is. 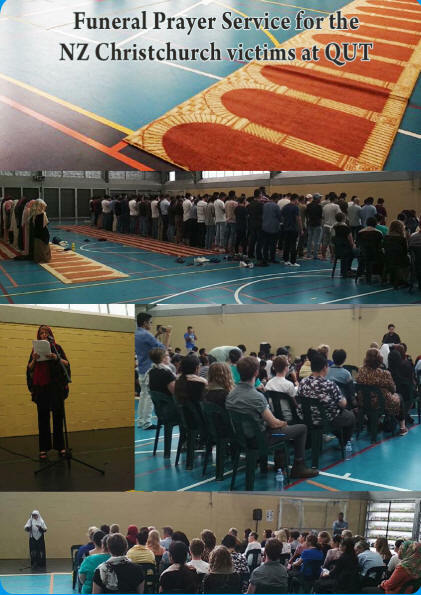 Organized by AMYN, funeral prayers were conducted by the UQ Muslim Chaplain for the Christchurch victims at UQ & QUT. "A powerful message from Christchurch, New Zealand to all those affected by the recent terror attack. May Allah have mercy on all the victims and grant them a swift entrance into Paradise. 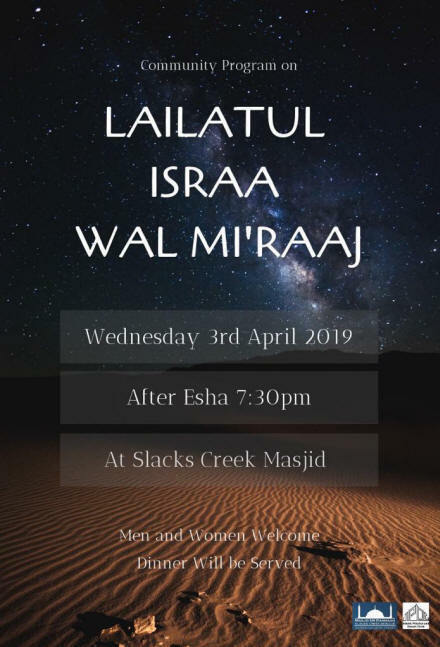 This short reminder focuses on the importance of grieving with the victims in a manner that befits the Prophetic Sunnah and not that of a passing social observer." A Maori Muslim elder, led the traditional Maori welcome, the Karanga, for Punchbowl Boys High School students in Sydney. 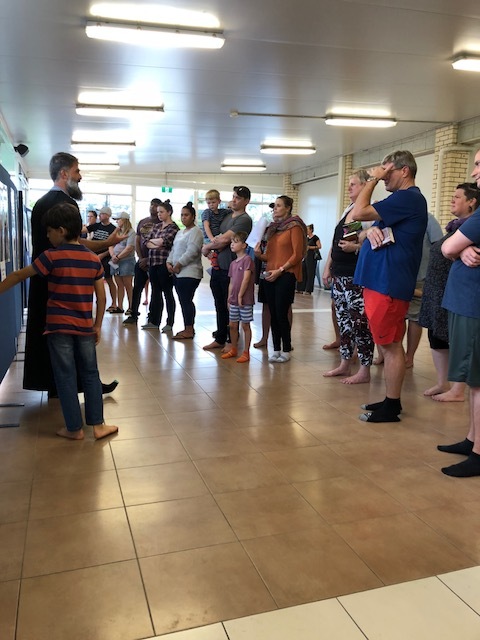 The boys greeted the custodians of Lakemba Mosque with the traditional Maori greeting, the hongi before performing a heartfelt hymn to acknowledge the lives lost in Christchurch and stand in solidarity with their Muslim brothers and sisters. to shock and horror I surrender. how can we remain sane? to solidarity and kindness, I surrender. how can my heart not be at ease? we bury a Muslim one after the other. to Islam and humanity, I surrender. as we lost and found one another. 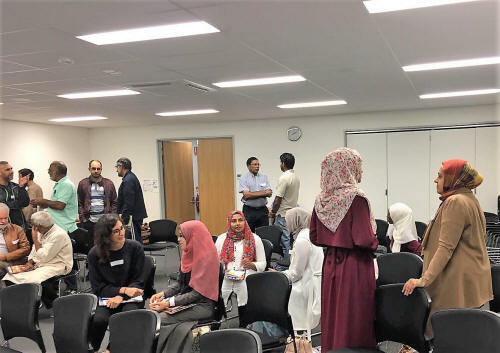 The workshop was attended by forty-two participants from diverse backgrounds from health, law, academia, social work, education, business and officials from Council of Imams Queensland (CIQ) and the Islamic Council of Queensland (ICQ) respectively. 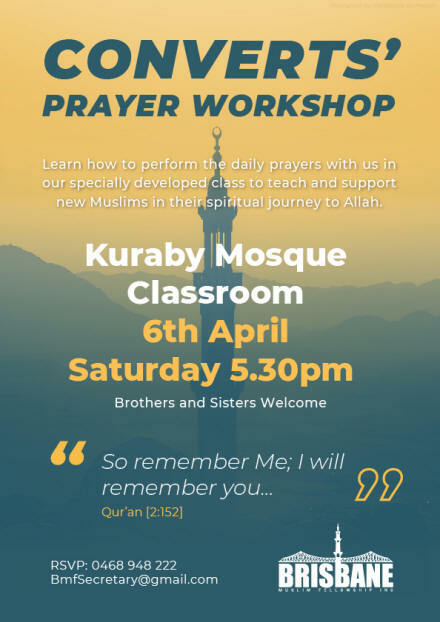 The workshop analysed the timeline of events that took place in response to the massacre from the Muslim and non-Muslim communities. 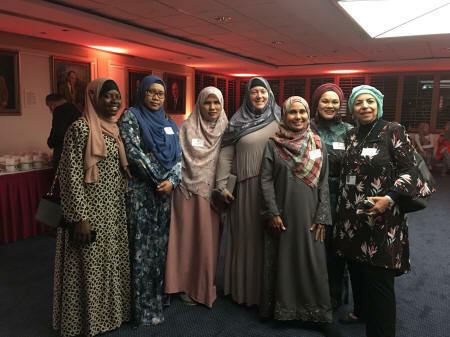 This included looking at the broad range of group responses, the courageous acts of individuals, the supportive and not-so-supportive actions of public officials as well as the ongoing efforts that contribute to social cohesion. 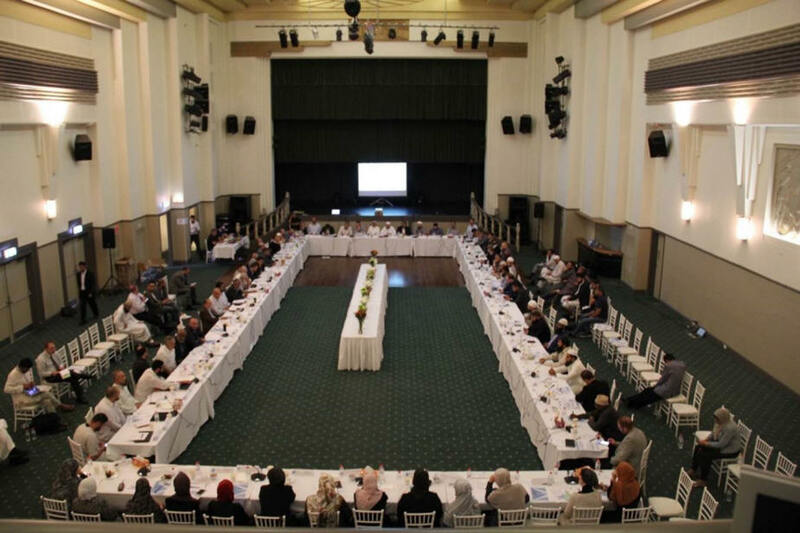 The workshop highlighted the need for further collaboration. 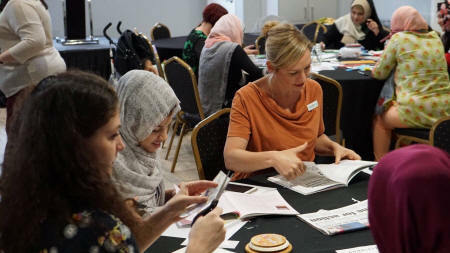 There were many examples of best practices in the timeline, however it was noted during the workshop that there is a need for greater sharing and communication of ideas, resources and practices across the community. It was acknowledged that while we have many different cultural traditions and experiences, we share common dreams and hopes for peace, security, opportunity, belonging and prosperity for our families and loved ones. 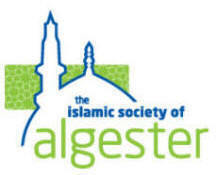 Moreover, we must remember that to be Muslim is to care for the welfare of humanity. 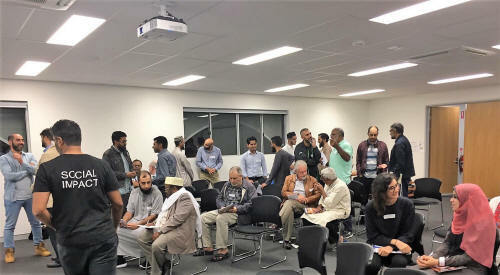 A report is currently being compiled from the outcomes of the workshop that intends to provide lessons from the responses to the Christchurch massacre so that we may grow as a community. Without question, Muslims have suffered, and continue to suffer, in many places throughout the world. 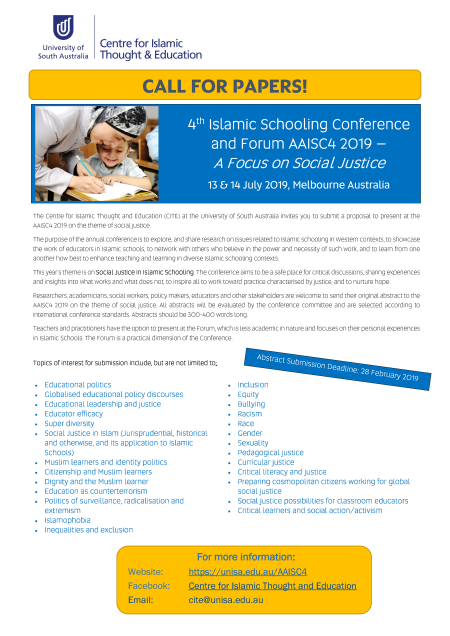 We hope that we can meet the challenges that face our community through clear and open channels of communication and collaboration with Islamic bodies, masjids and welfare groups. 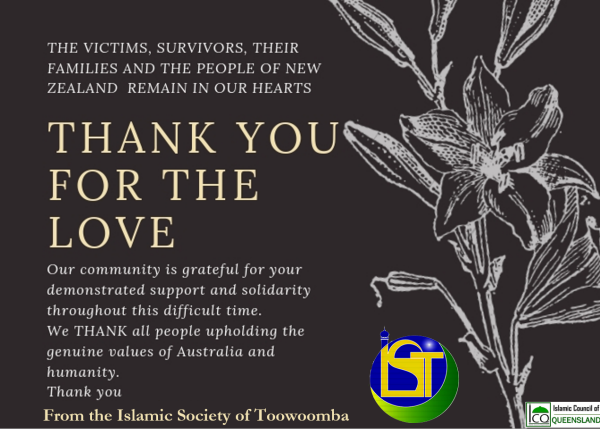 We have seen clear signs of concern and care by the greater Australian community which emphasises our shared humanity. Now, more than ever, we must welcome those who show concern and be patient with those who are indifferent. All of us have a role to play. 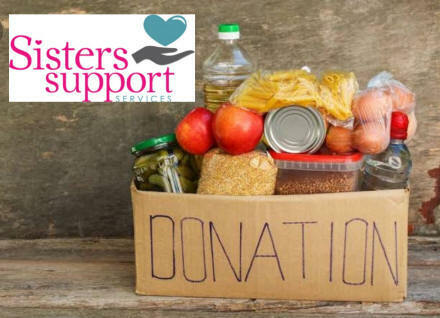 Perhaps the simplest charities, like a welcoming smile, are among the best ways to build bridges of understanding and respect. 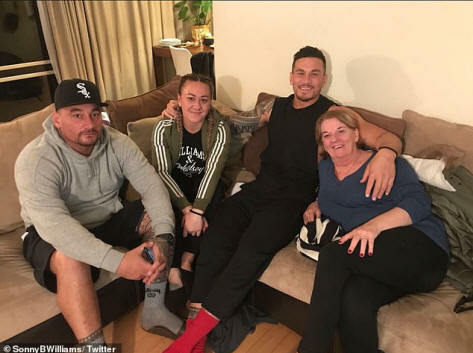 Rugby union star Sonny Bill Williams' mother and best friend have converted to Islam less than a fortnight after the Christchurch massacre. 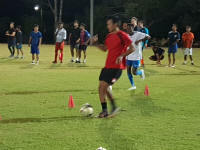 The 33-year-old New Zealand athlete's mother Lee Williams and his teammate Ofa Tu'ungafasi have taken the Shahada, the Islamic creed declared when accepting Muhammad as God's prophet. 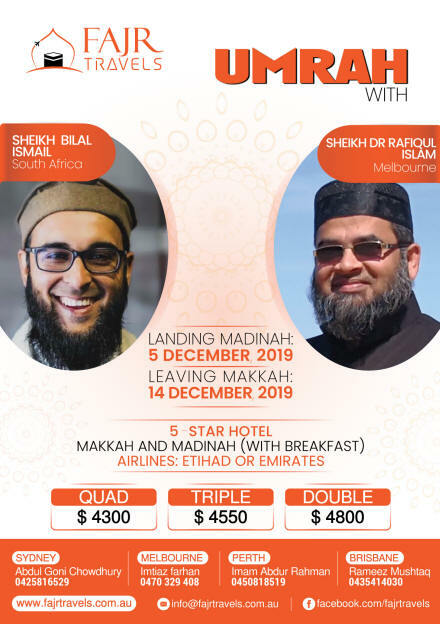 Muslim sheikhs have been celebrating the news, including Zimbabwean-based imam Sajid Umar who showed his support on Twitter on Tuesday. 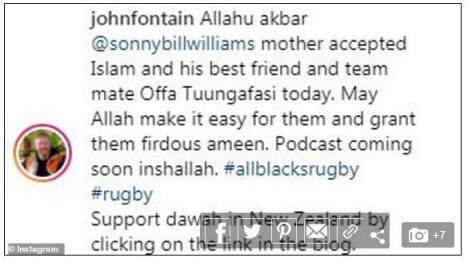 'Just came across great news that the mother of our brother @SonnyBWilliams accepted Islam, along with his best friend and team mate. All praises belongs to Allah alone. He is most kind. Even though I'm far away; I am genuinely pleased for my brother. Allah has honoured him', he tweeted. Photos of the ceremony, posted by fellow converted Muslim John Fontain, show Tu'ungafasi dressed in white tunic alongside Williams. 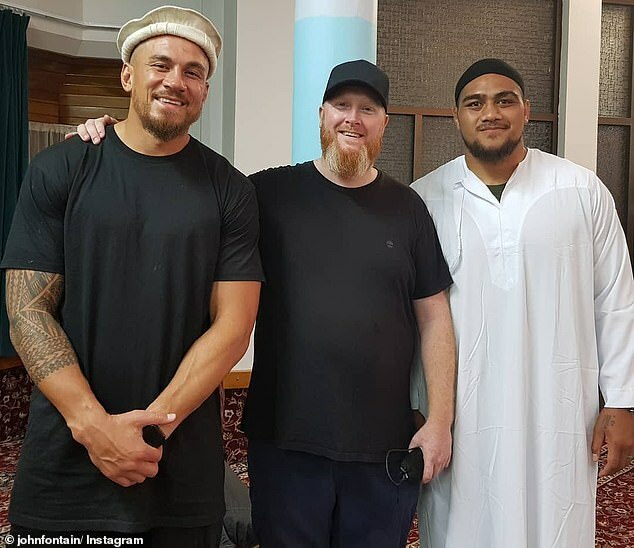 Lee's and Tu'ungafasi's religious commitment comes a decade after Williams himself became a Muslim and quit drinking and less than a fortnight after Australian gunman Brenton Tarrant allegedly killed 50 Muslims at two mosques in Christchurch. 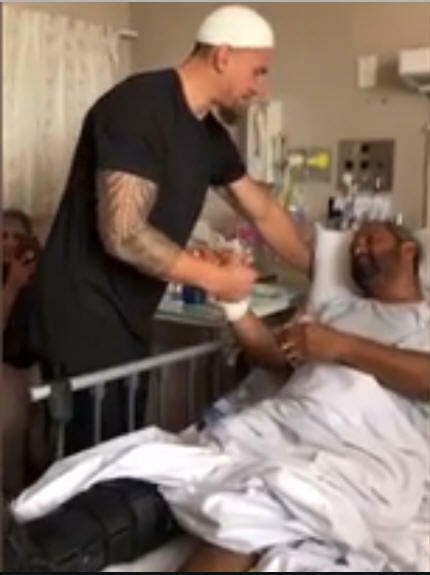 Williams met with survivors of the shooting in hospital on New Zealand's South Island on Saturday and was joined by Tu'ungafasi, and Richmond Tigers player, Bachar Houli. 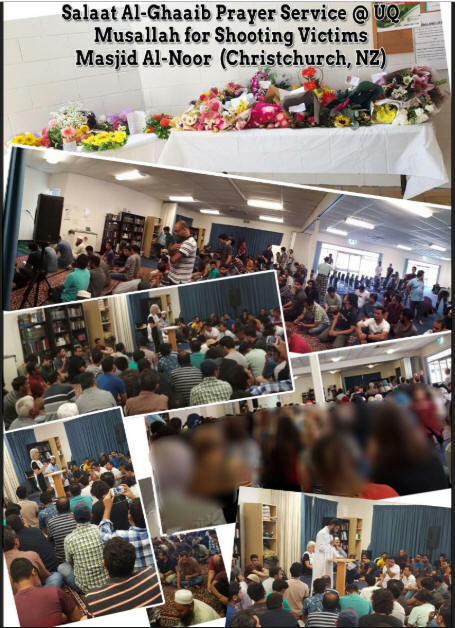 The All Blacks centre also joined hundreds of fellow Muslims and thousands of other New Zealanders for prayers at Hagley Park in Christchurch last Friday as the country fell silent to remember the victims. Williams, whilst fighting back the tears, said: 'I just heard the news and I couldn't put into words how I'm feeling right now. Last year, Williams travelled to Mosque of the Prophet in Medina in Saudi Arabia before making a pilgrimage to the holy city of Mecca. Footage posted to social media showed Williams being led into an Islamic prayer by Sheikh Kamal Abu Mariam as they stand beside the grave. Williams' manager confirmed to Daily Mail Australia that Lee Williams converted to the religion on Tuesday. 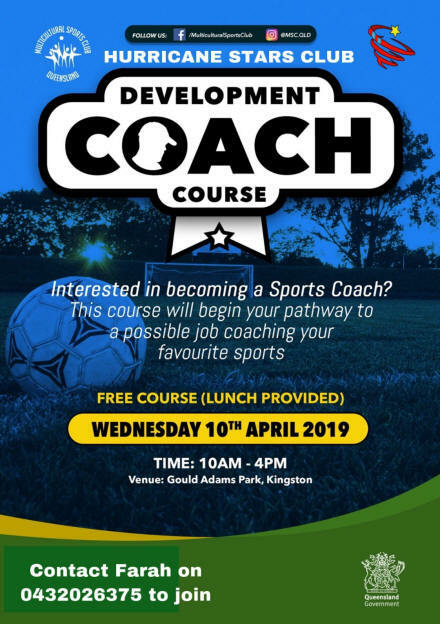 Williams' mum had continued to work as a carer at a retirement home in Auckland's Mount Albert district as her son became a rugby league star in Australia and later played for the New Zealand All Blacks. 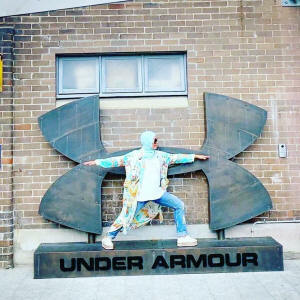 In 2016, he revealed he managed to buy his mum a house and regularly helps out his family members including New Zealand Olympic rugby star sister Nial. Lying down in his hospital bed, 47-year-old Shah, who was born in Grassy Park and grew up in Atlantis, was surrounded by his wife Shamilah, and their three daughters Zakkiyyah, Salaamah and Aadilah as as the New Zealand Prime Minister Jacinda Ardern also popped in to visit him. The fitter has been living in New Zealand for 12 years, and is a citizen, coming out to South Africa every few years to visit his family. 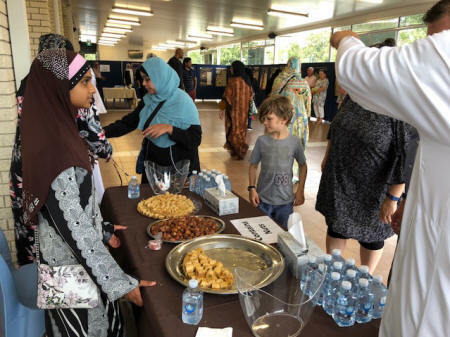 The youth at the Darra Mosque organised a hugely successful Open Day for the local people who have supported Muslim community in the aftermath of the Christchurch tragedy. 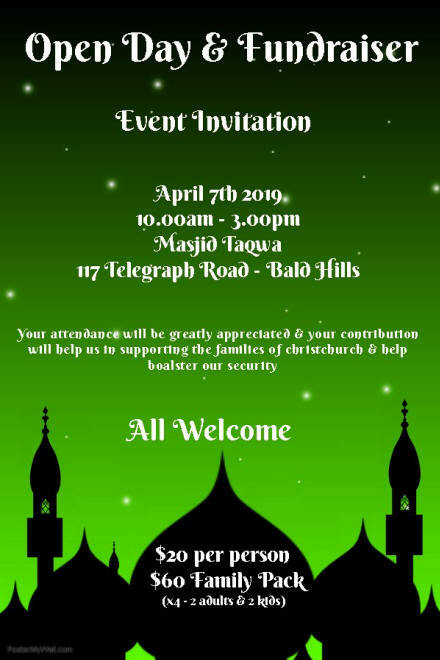 The open invitation to the event read: In appreciation of the love and support we have received due to the recent tragedy in Christchurch. 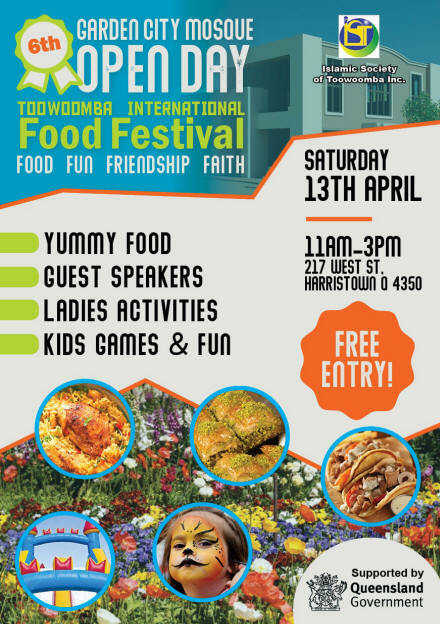 Your local Muslim community welcome you & your family to join us for a sausage sizzle. Take a tour of our place of worship, chat over some tea and coffee while the kids get serious in the colouring corner. A constant flow of some four hundred people called in during the hours from 10am to 2pm. 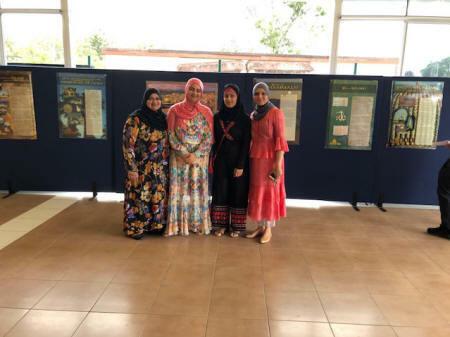 In addition to tours of the Mosque, there was an impressive display of posters explaining the Islamic religion and cultures, a henna table, calligraphy table, dawah table and children�s activities. 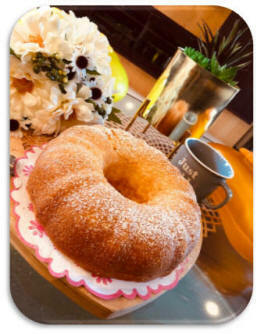 Guests were treated to baklav, biscuits, drinks and tea and coffee. 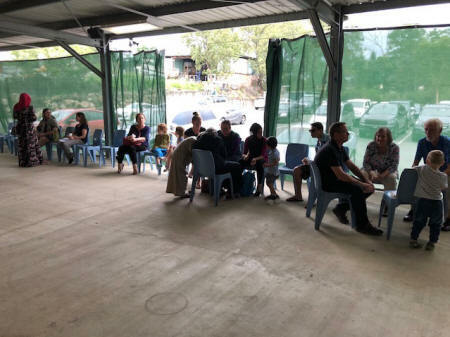 There was also a sausage sizzle accompanied by spring rolls and halva around which the guests got an opportunity to meet and greet. The police were also on duty and said they appreciated the hospitality extended to them. 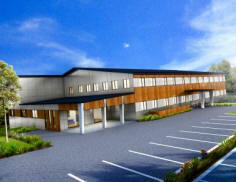 Many of the visitors commented that they would like to visit on more open days. The Oxley Nursery gifted fertiliser for the Foxtail Palms in the car park. 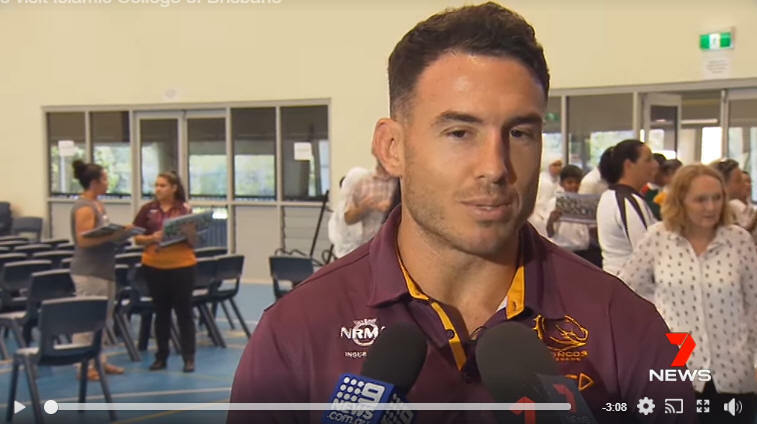 Six Brisbane Broncos players visited the Islamic College of Brisbane this week to show their support for the Islamic community and highlight inclusion, following the Christchurch massacre. "It's just good to show our support, make sure everyone knows we're all valued members of the community, whatever background or where you're from." - Darius Boyd, Broncos Captain. Free tickets were given out for the Thursday game. 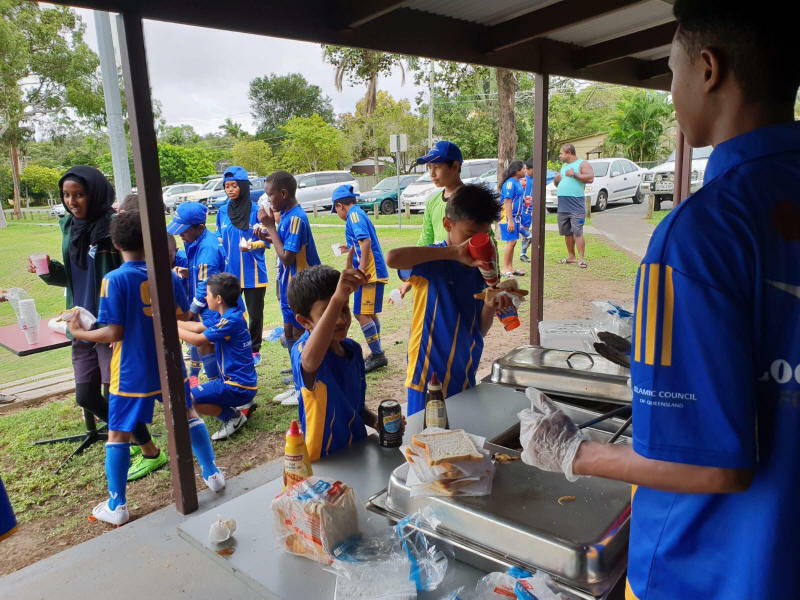 On Saturday the 30 March, the Logan Roos Football Club hosted a community barbecue at their clubhouse in Oates Park Woodridge. 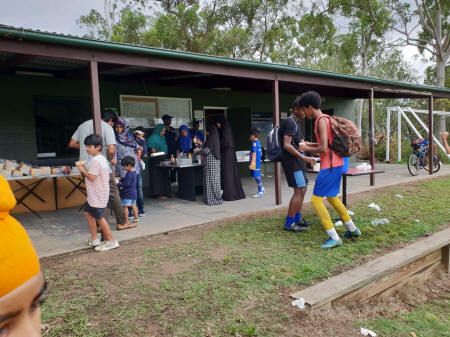 It was sponsored by Logan City Council and attended by a wide range of community members who enjoyed a halal sausage sizzle at the majority Muslim soccer club. 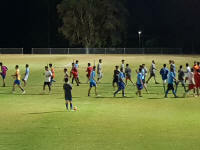 The club was able to celebrate their great achievements over the past 2 years and share their success with the community. 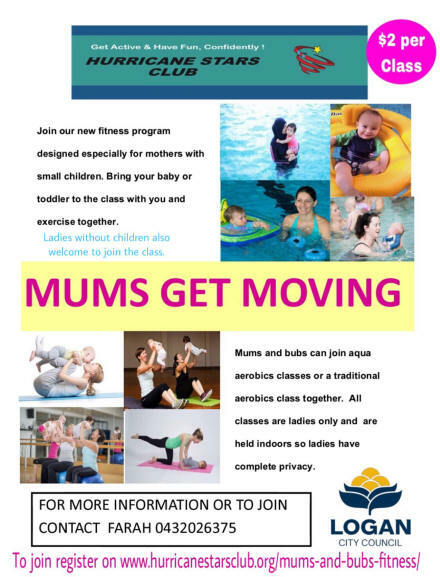 Demonstrating to the community the friendly family attitude amongst the club members and their families. Member for Stetton, Duncan Pegg speaks in Parliament about Kuraby local Hazem Hamouda, who has been detained without charge in Egypt for over 14 months. I rise today to speak about Hazem Hamouda, a 55-yearold father of six from Kuraby in my electorate who has been detained in Egypt now for over 14 months. 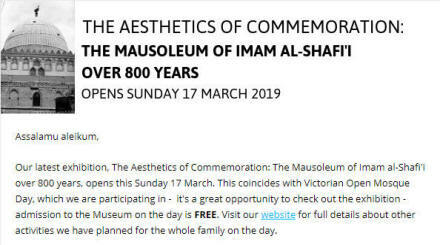 I acknowledge the presence in the gallery of Hazem's wife Evelyn, his daughters Lamisse, Jasmine and Amira and also his granddaughter Amalia. The nightmare for the Hamouda family began back on 25 January 2018 when Hazem landed in Cairo for a two-week holiday with his family. Hazem was to meet up with his children Lamisse, Saja and Haroom, who were already in Egypt. Hazem never made it past airport security. He was detained for two days at the airport. For eight days his family searched for him in Cairo as they had no idea where he was. Eventually they found Hazem in the notorious Tora Prison where he was kept for 22 hours a day in a nine by three metre cell in appalling conditions with 13 other men. He slept on the floor as there were no beds. Hazem had trouble getting the correct medication and he contracted scabies. Hazem's daughter Lamisse gave up her studies and her job to try to help her father and also bring him food. Over the weekend of 16-17 February this year the family were informed that Hazem was due to be released from Tora Prison on 18 or 19 February 2019 following an order from the prosecutor general Nabil Samek. The family were obviously very excited when the Department of Foreign Affairs contacted them to say that Hazem would be released with all charges dropped and they were understandably distraught when Hazem was not brought to the appointed police station. He had disappeared. Hazem was eventually located and finally released in the early hours of 6 March 2019 having spent 405 days in arbitrary detention. To make it clear, at no stage did he ever have a charge laid against him and at no stage was there ever any evidence presented against Hazem at any point. Ultimately, Hazem arrived at the airport on the evening of 6 March this year with his daughter Saja. Their passports were confiscated and Hazem was informed that because he had been in Egypt for more than six months, despite the fact the only reason for him staying longer than six months was his detention by Egyptian authorities, he was required to produce a national ID document or a birth certificate and a military service exemption permit. Hazem was unable to produce his national ID document because it was lost by the police during his period of detention. Plain-clothes national security officers were present at the airport when he was refused the ability to leave the country causing Hazem significant distress and concern he would again be arrested. He requested sanctuary in the Australian Embassy but this request was refused. Hazem has since requested the support of the federal government to obtain the relevant documents he needs to be able to leave the country and this support has also been refused. Currently Hazem is stuck in Cairo waiting for a military exemption certificate and the hearing is happening this Saturday. While the federal government has been offering consular assistance to the family, this assistance has been limited. Hazem has requested further help from the federal government so that he can return back to my local community. I strongly urge the federal government and the Minister for Foreign Affairs to do all they can to bring Hazem home. Hazem's torment of imprisonment without evidence, without trial and without due process has continued far longer than any respectable justice system should allow. I well understand what Hazem and his family are going through and I call on the Interior Ministry to correct this injustice and release Hazem immediately. I also urge Australia's foreign minister Marise Payne to do all she can to find the Australian national and have him returned to his family in Brisbane. Australia is home. It is my country. It is who I am. My release will be completed when I am reunited with my family back home in Australia. Hazem may not be a famous sports star, he may not be a celebrity, but he is a local father in my community with a family who loves him. In fact, he has lived in Australia for over 30 years. It is well and truly time to bring Hazem home, back to his family and his local community where he belongs. 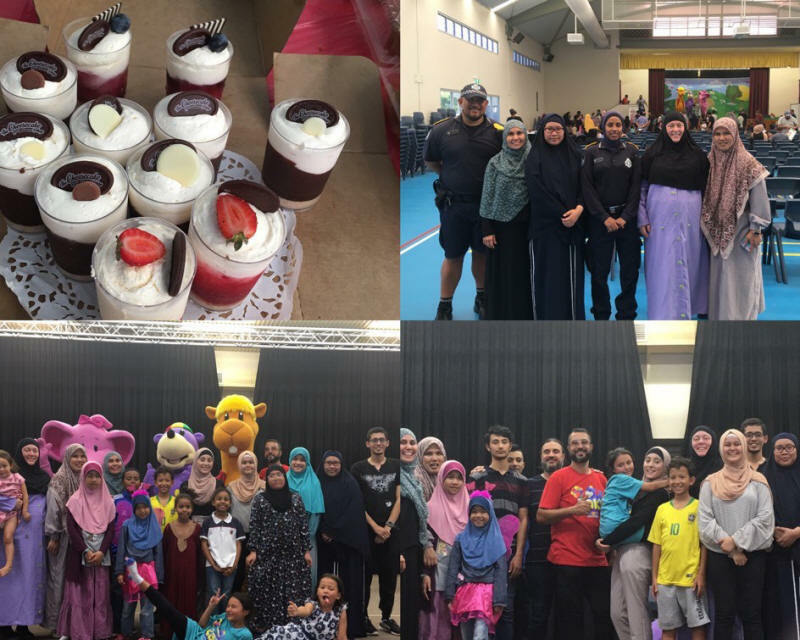 On Sunday March 24, the Zaky and Friends Live Show was held at the Islamic College of Brisbane with more than 240 parents and kids attending the show. 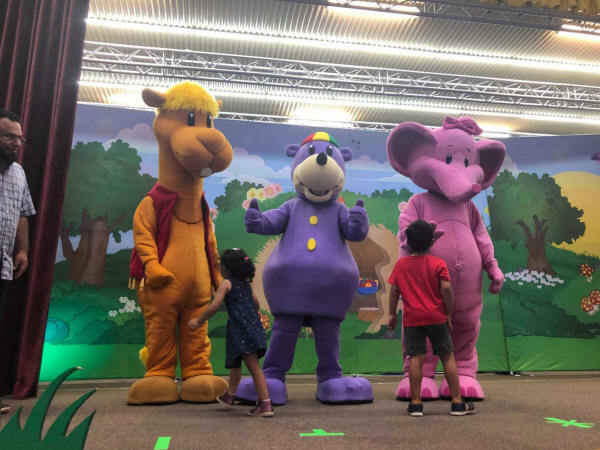 Zaky and his friends, Kazwa and Nadeen, sang nasheeds, danced and entertained the children, while at the same time educating them all about the Greatness of Allah. Junaid Ally was an amazing MC for the show, where he organised a number of stage games with the excited kids during the intermission break, so that the Zaky team could have a break from their very hot costumes. The games allowed many of children to come up on to the stage and win amazing prizes, like their own plush Zaky and Kazwa toys. The show was a great success, with parents and kids having so much fun and having nothing but praise for the professional show being put on. We are very happy to say that 100% of all ticket sales during the School shows as well as the Sunday Live Show goes back to One4Kids to help towards making more Zaky animations in the future. 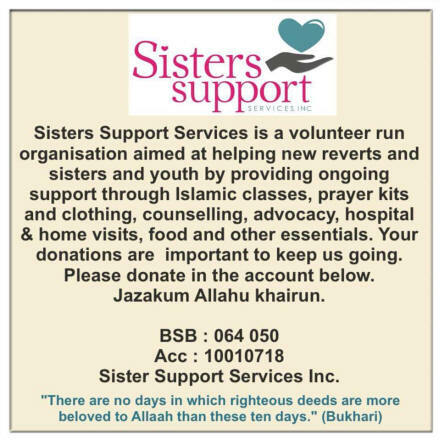 The Hurricane Stars Club team was very excited to volunteer their time to support these shows as a sadaqah jariyyah towards future productions and developments of Halal Islamic children entertainment. 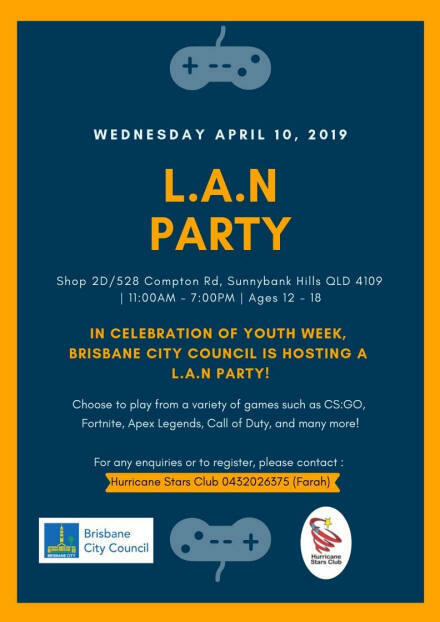 As part of fundraising efforts, the Hurricane Stars Club had a stall at the show selling hot food, desserts, drinks, popcorn and fairy floss. Parents and children lined up patiently to order and it was a pleasure to see exemplary behaviours from all attendees. Indeed this bodes well for the future of the younger generations that usually learn more from actions rather than words of their parents. 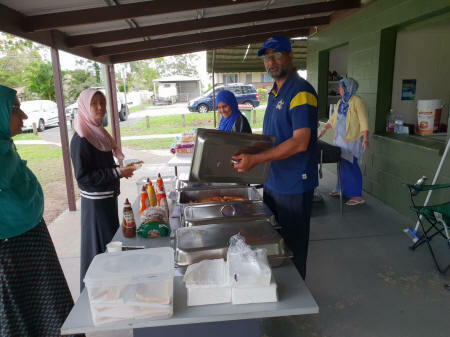 We are very grateful to Sunny Meats butcher shop in Sunnybank Hills Shoppingtown for sponsoring the delicious sausages for the sausage sizzle and the Cheesecake Shop in Sunnybank Hills for providing amazing desserts that quickly sold out, both Muslim-owned businesses who are always very supportive. We also would like to thank some amazing ladies in the community who made and donated delicious cupcakes and cakes for us to sell. 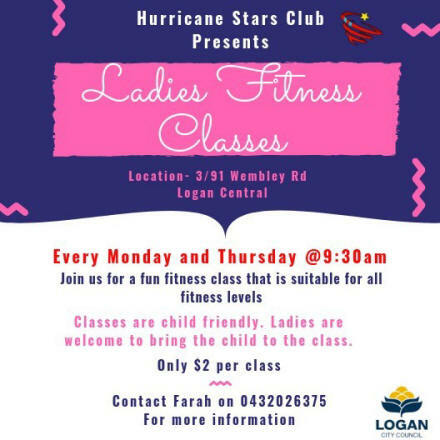 All funds raised from the food sales will go back towards supporting the various Hurricane Stars Club�s volunteer-run community programs. 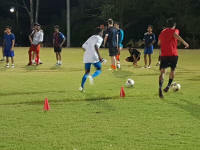 It was an amazing experience for the Hurricane Stars Club team and an honour to meet and help the talented founder and manager of One4Kids Subhi Alshaik and his staff and family. We look forward to their return in Ramadan to premiere their new Ramadan-themed Zaky film as well as further cooperation with them in the future in shaa Allah. 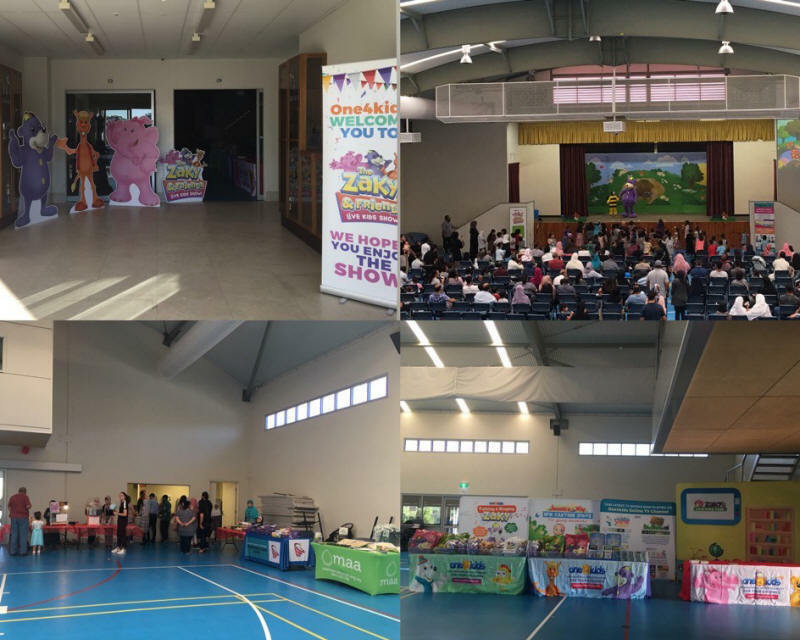 On October 2018, the Hurricane Stars Club saw the advertisements for the Zaky and Friends Live Show in Sydney and they contacted the One4Kids team in Sydney and volunteered to help them bring the show to Brisbane for the first time. 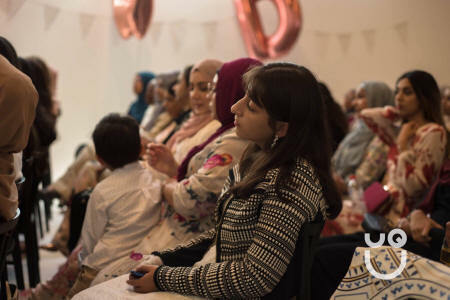 Members of the Hurricane Stars Club have children that have grown up watching Zaky's songs and dvds so they were all excited and passionate to support the development of Islamic animations for children. 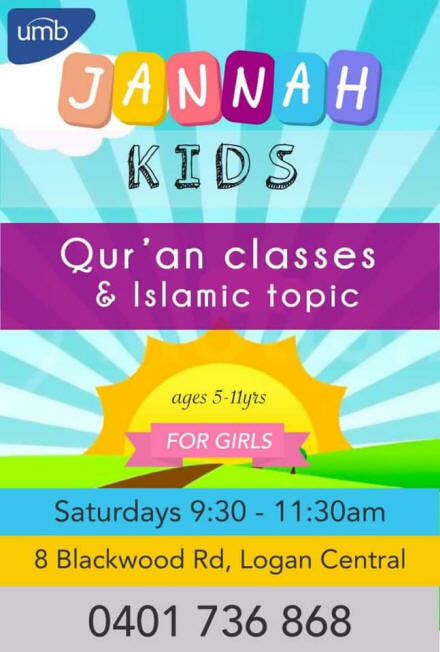 More than that, these efforts are to promote Halal entertainment alternatives that are of high quality, engaging as well as educating for Muslim children. 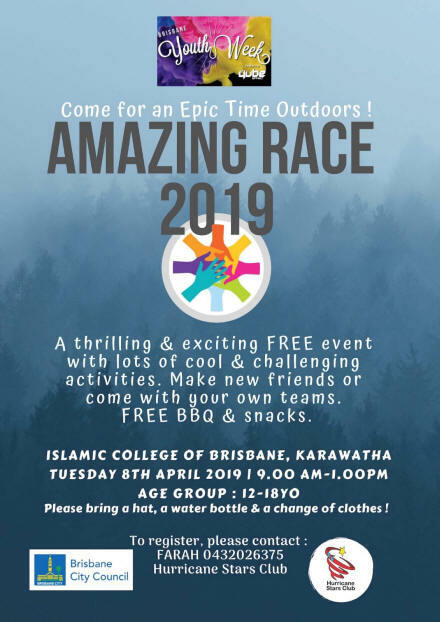 The Hurricane Stars Club team volunteered their time to help One4Kids to organize school shows for the younger grades at Brisbane�s two Islamic schools, the Islamic College of Brisbane and the Australian International Islamic College. 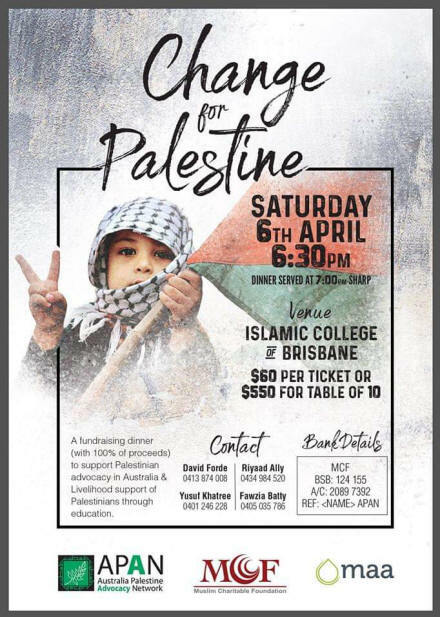 Then they also coordinated a Sunday Live Show on stage at Islamic College of Brisbane open to all, especially for those children who do not attend the Islamic schools. Promoting the show was not an easy task. 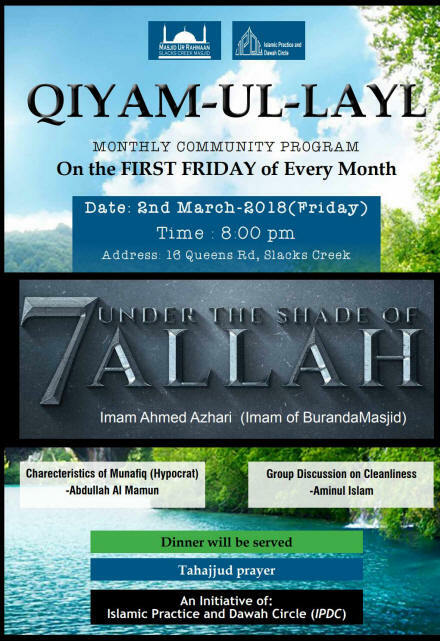 Other than using social media to announce the coming of Zaky and Friends to Brisbane, our volunteers have spent the past month going around Brisbane�s mosques handing out flyers after Jummah to promote the upcoming show. 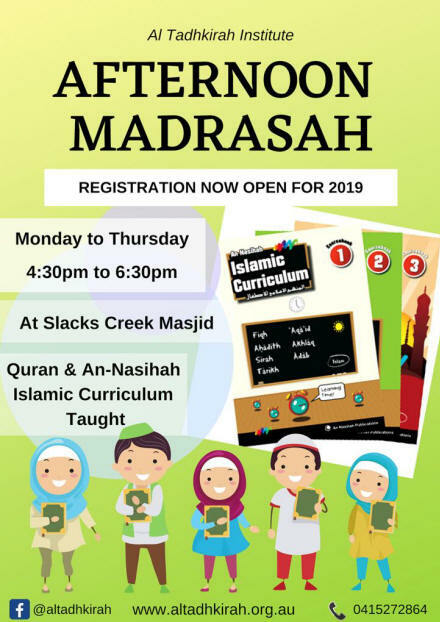 We also had to stand at the gates of several schools with majority of Muslim students at pickup time to handout flyers to parents. After all the hard work of promoting, it was at last the time for the One4 Kids team to arrive in Brisbane. 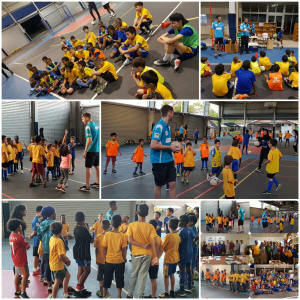 They stayed for one week and the Hurricane Stars Club team volunteered to bring them around Brisbane for Meet and Greet sessions beginning with babies and toddlers in our own Little Stars Playgroup and also with kids in the local madrassahs and to the school shows. Children of all ages (and teachers!) 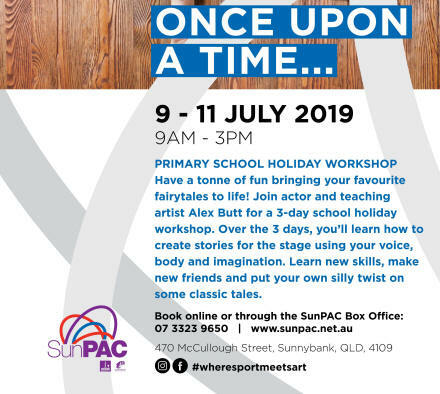 enjoyed interacting with Zaky and these sessions have increased awareness of the good work that One4Kids are doing in children entertainment. 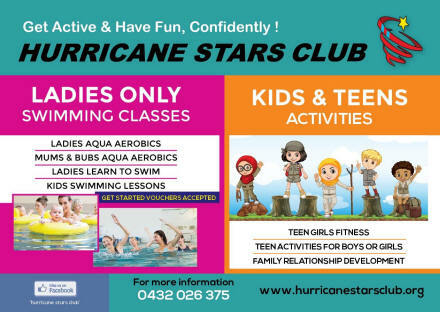 To be updated on our programs and activities for the community, please like and follow our FB page or Instagram account "Hurricane Stars Club". 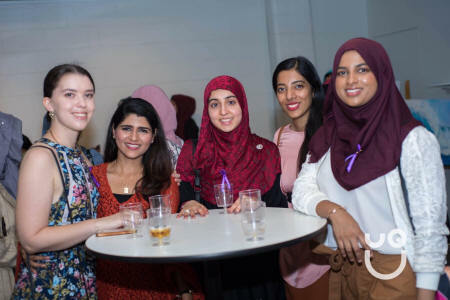 The UQ Muslimah Society in collaboration with the UQ Arab Association, held its International Women�s Day Brunch on Sunday 10 March at the beautiful Newstead Studios. The sold out event with over 100 guests was an opportunity to mingle, network and listen to empowering and inspirational speakers. 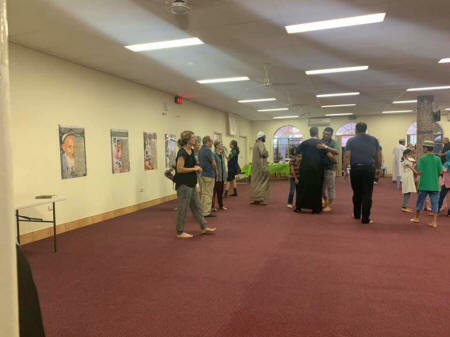 The event boasted an art exhibition from local artists such as ceramic artist Ronelle Clarke, Fifth Dimension artist Gabrielle Conescu, LovelyLane Creations founder Andrea South and Islamic artist Shaheda Osman Prints. The talented Huda Fadlelmawla delivered a powerful spoken word piece, and vocal performer Aaishah Ahmed made her debut appearance. Journalist, producer and founder of �Mindful Living�, Lujayn Hawari gave the keynote speech. 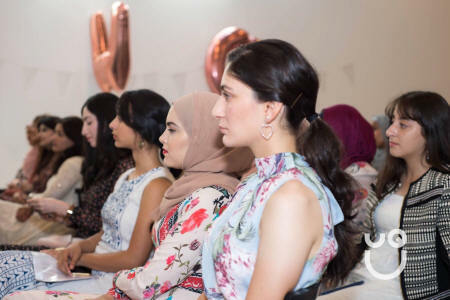 The female entrepreneur panel and Q&A provided great insight and advice to young women wanting to start business ventures; whilst the Creators of Change panel and Q&A inspired guests to make impactful change in their communities. 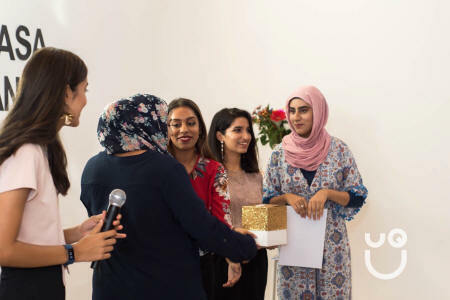 The Hajera Bibi Seedat Emerging Leader of the Year award for 2019 was presented to Aryana Mahmood for her selfless commitment and involvement with the QLD Afghan Community Association. 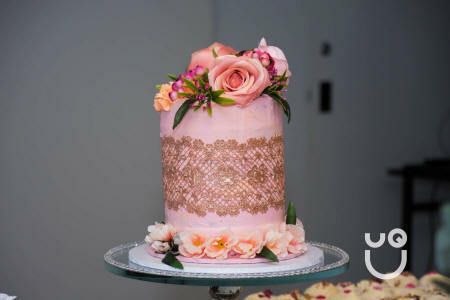 Guests were treated to a delicious grazing board brunch catered by Events By Aysha (Aysha Sabdia), and a beautiful four-tiered, rose gold lace cake was kindly donated by Sweet Pea Creations (Yasmin Omar). The event concluded with an uplifting group affirmation practice, and each guest received a luxury pamper giftbox. 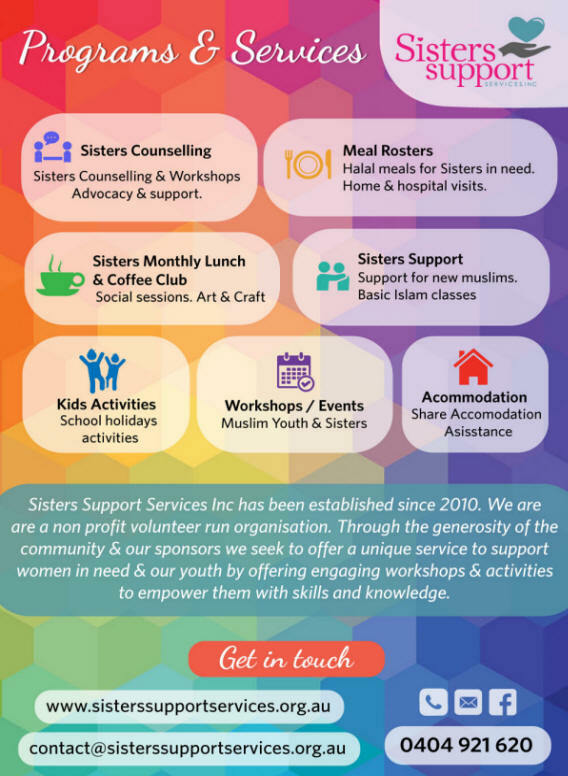 JazakAllah to our lovely guests and sponsors (Islamic Council of Queensland, Pascoe Vale Rd Family Clinic and Senator Larissa Waters) for supporting our events. 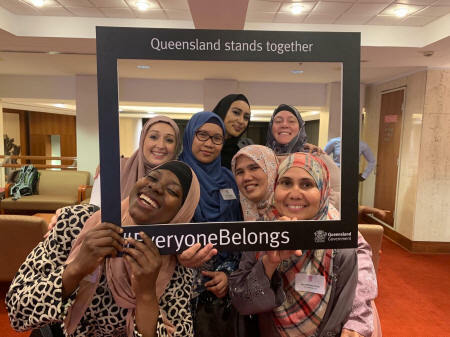 The Premier of Queensland, Annastacia Palaszczuk held a Harmony Day Reception at Parliament House this week. 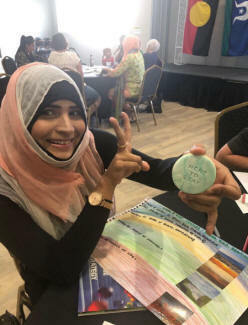 Ms Nadia Saeed (pictured above) was the keynote speaker and told the audience of her experiences growing up as a Muslim in Queensland as well as her reflections on global issues currently at play in the world. 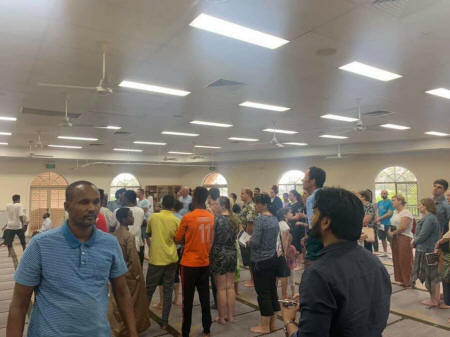 The Cairns Islamic Society & Cairns Mosque opened their doors to the public on the weekend in light of the Christchurch attacks. They were completely overwhelmed by support from members of the community. 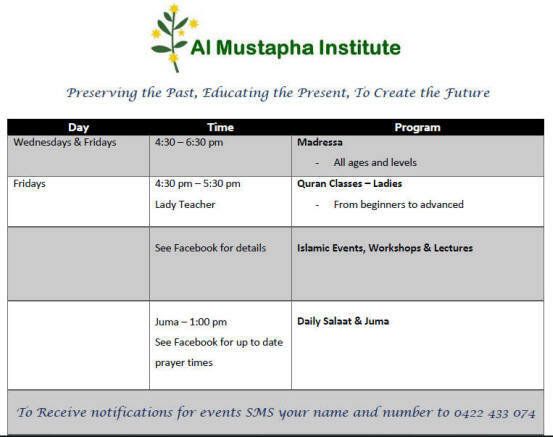 On the morning of Thursday 28 March, Muslim ladies attended a delightful day full of fun activities under the theme Crafting the Future. 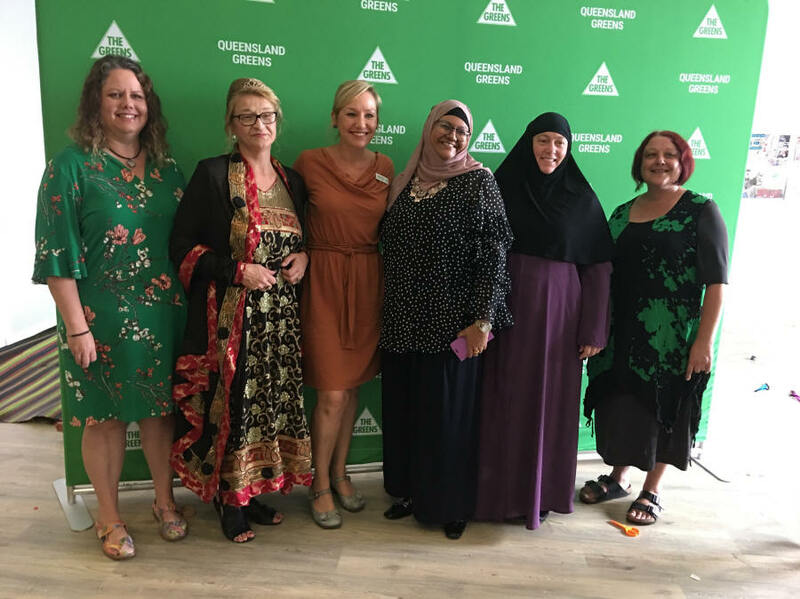 Held at Islamic Women�s Association of Australia (IWAA) the event was co-hosted by the Greens Senator for Queensland, Senator Larissa Waters, the Hurricane Stars Club and Multicultural Families Organisation (MFO). The day began with a welcome to the country by Kiana Piazetta Charlton and a welcome note by Senator Waters. Larissa, who is a mum of two herself. She emphasized the importance of affordable childcare for everyone leading on to similar options for TAFE and affordable University education. After a brief introduction, the audience broke into small groups and started the first activity of the day. 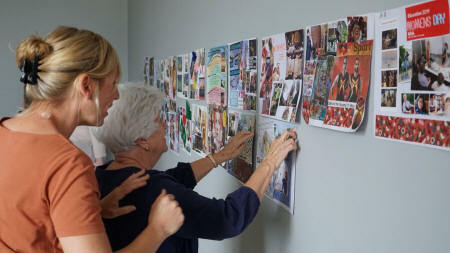 All attendees including Senator Waters designed their vision boards, on the theme �women in 21st century and what we want�. It was empowering to see women from all different ethnicities and backgrounds working in the same space creating their own boards and helping each other with ideas. They later reflected on the strong sense of independence and positivity that they felt. After the first activity was over everyone who wanted to pray, took a prayer break followed by delicious lunch from around the world. 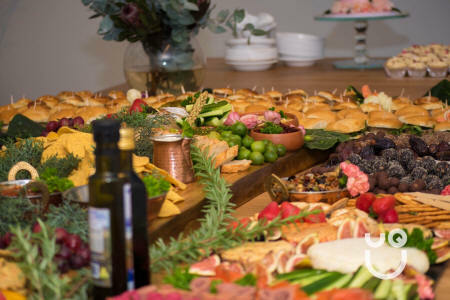 There were flavours of Bosnian Ricotta Pasteries, Pakistani Chana Chaat, Pizza Bread, Iraqi Hummus, Lebanese Baklava and last but not least some delish handcrafted cookies handcrafted by Radical Passion Cakes. The cookies were stamped with slogans like �all equal- all different�, �here to stay�, �the future is female�, �sweet and strong�. The second activity started with formal welcome by Senator Waters sent her condolences to the wider Muslim community on the Christchurch terrorist attack. She assured the Muslim community of Greens unrelenting support and solidarity in these testing times. A panel discussion on diverse issues involving women followed suit. 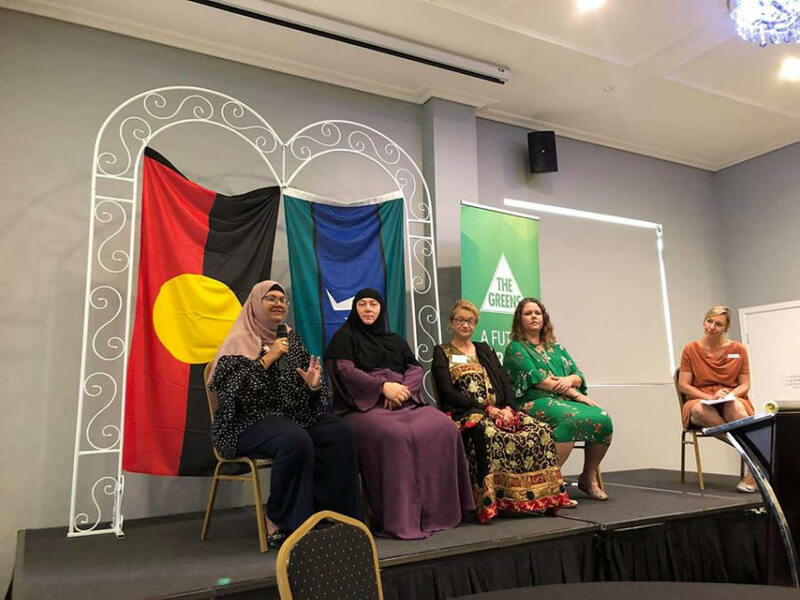 Our panellists included Princess Lakshman from the Muslimah Mind Matters, Farah Scott from the Hurricanes Stars Club, Cornelia Babbage; the Queen of Multiculturalism, wearing her Queenie tiara and a dazzling attire from the Multiculturalism Families Organization Gold Coast, Kirsty Peterson (Greens candidate for Forde) family lawyer and mediator. The panel was moderated by Senator Larissa Waters . 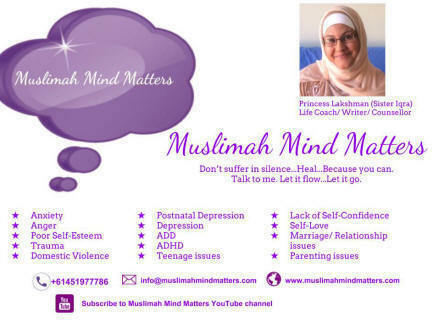 We heard moving stories of courage and determination from these brave women focusing on women�s wellbeing in general. The panel concluded after the question answer session and everyone took pictures with their smashing cookies. 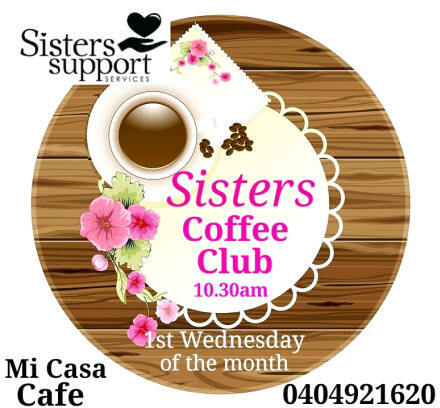 Amongst other members from Greens, IWAA, MFO, Hurricane stars club were Patsy O�Brien, Greens candidate for Moreton and Tracy Burton, Greens candidate for Fisher. 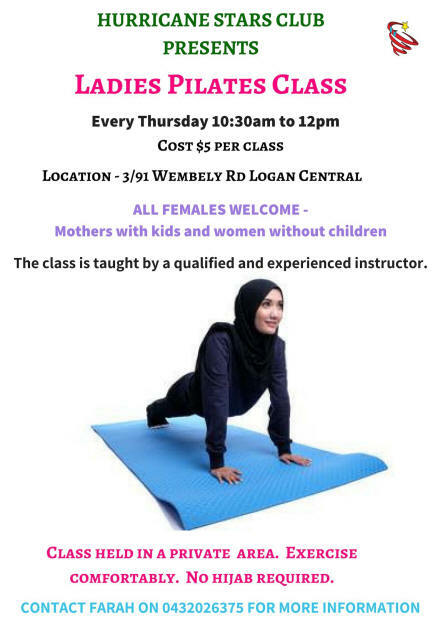 The day ended on a sweaty note when all the women moved their muscles in a very energetic exercise session. It was day designed in a way that women from all cultural backgrounds could feel relaxed in a space where they felt comfortable and safe. 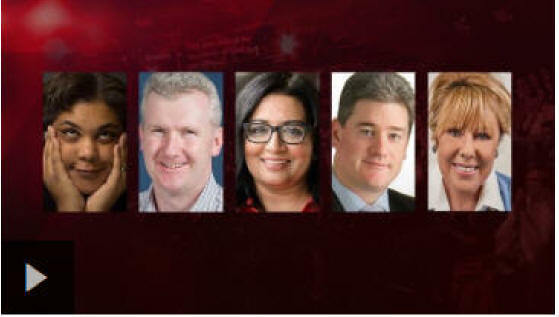 Panellists: Roxane Gay, Writer, editor and 'Bad Feminist'; Tony Burke, Manager of Opposition Business; Mehreen Faruqi, Greens Senator for New South Wales; Simon Cowan, Research director, Centre for Independent Studies; and Teena McQueen, Federal Vice-President Liberal Party. But the...it also says... If we look at the letter, it also says that there was intervention in spreading fake news, that there was intervention and hacking of Democratic Party emails. So, we should be really concerned about that. But I think, if we are concerned about what Trump means for the US, what Trump means for the world, then we should be concerned about his politics. His politics of racism. You know, he�s had... He�s called for a travel ban from people from Muslim countries. He is demonising Mexican immigrants. He is a standard-bearer for sexism. He�s cutting back women�s rights to choose. That�s what we should be worried about. That�s what we should be calling out every single day and helping our friends in the US to get rid of him at the next election. Um, Rabia, I completely feel for you and your pain. Like, we are all shattered still from what happened in Christchurch and, you know, we are still grieving for the friends and families of the targets of the horrific terrorist attack. 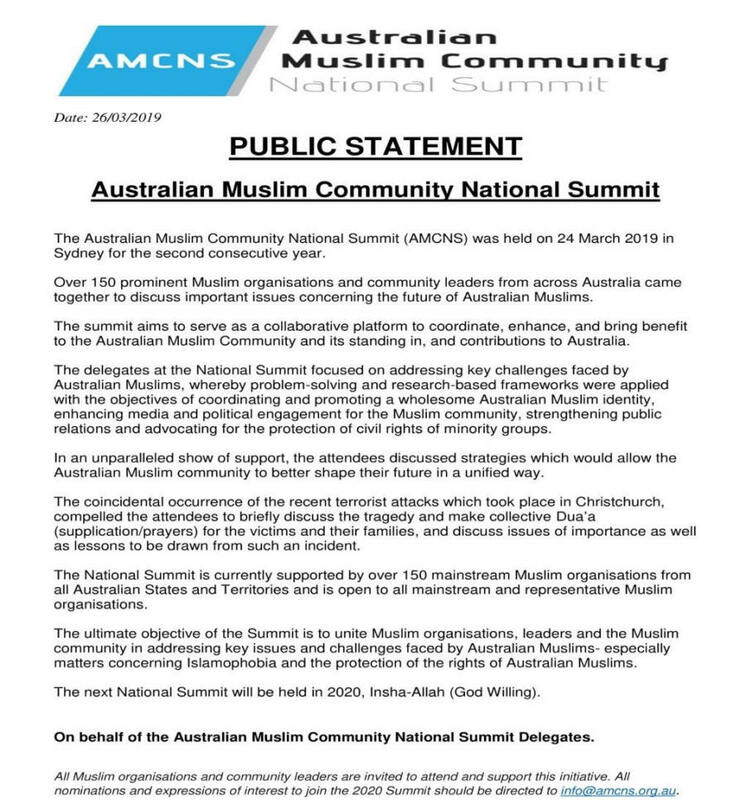 Uh, but, you know, since the attack has happened � and even before the attack had happened � um, you know, Muslim Australians, for years, had been talking about this hate speech, this vilification, this demonisation of migrants and of Muslims that had started happening in Australia, but in the highest office of Australia. And we had been saying that this is damaging, this is hurting, and this will have consequences. But it wasn�t just us saying it. It wasn�t just me saying it. You know, our previous Race Discrimination Commissioner has clearly said that, you know, what he has seen, what research suggested � that hate speech and political violence are linked. In the aftermath of this attack, the New Zealand Prime Minister Jacinda Ardern wasn�t shy of saying that, you know, hate speech leads to extremism. There are experts in the UK who have said that, you know, mainstream newspapers, when they spread this hate, they do actually feed the radicalisation of far-right extremists. Referring to a �final solution� � that�s not subtle. You know, calling for a certain community in Australia � and this is Minister Peter Dutton I�m referring to � that it was a mistake to let them in? That is not subtle. I think there is a clear difference between freedom of speech and hate speech. We do not have to blur the line. Like, in a democracy, I would defend freedom of speech to the nth degree, but I will never, never say that hate speech is freedom of speech. But I think what�s really important here as well is that, you know, our leaders are not learning. This is what has put me in a bit of despair after Christchurch, is that we have been saying this for years. We are still saying this. And, you know, neither Scott Morrison nor any of the Liberal-National government are actually listening. They�re just dismissing it as if, you know, it doesn�t mean anything. They have to admit that this has been happening, they have allowed it to happen, they have to reflect and they have to change. The Multicultural Queensland Awards recognise the valuable contributions of Queenslanders who support and promote an inclusive, harmonious and united Queensland community. The most prestigious and longest running Multicultural Awards program in the state, the Multicultural Queensland Awards provide individuals and organisations with a unique opportunity to showcase their achievements, best practice and innovation. The awards not only highlight the value of diversity, but also open doors for winners and finalists. Nominations for the 2019 awards are now open until Thursday 18 April 2019. 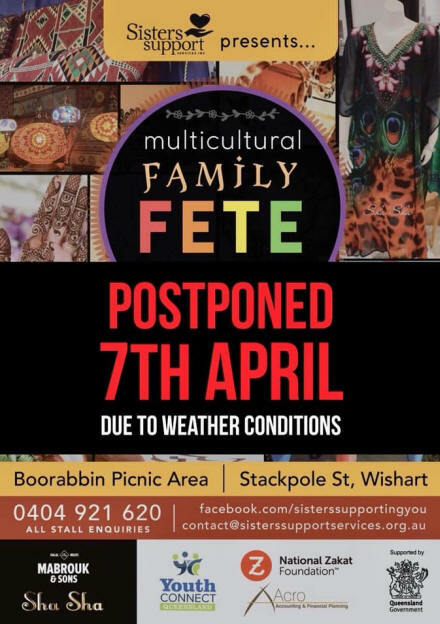 There will also be a Minister�s Multicultural Award that recognises the outstanding achievements of a finalist, selected by the Minister for Multicultural Affairs from all finalists. Four finalists will be selected under each category. 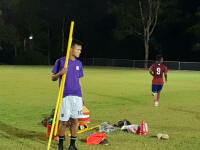 One winner will be selected from the finalists and recognised with an award at the Multicultural Queensland Awards dinner to be held on Friday 30 August 2019, during Multicultural Queensland Month. Esmail Suleman Patel is profoundly deaf and uses British Sign Languages. 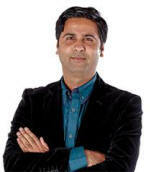 He is one of the founders and CEO of Deaf Education Advocacy Fellowship (DEAF). 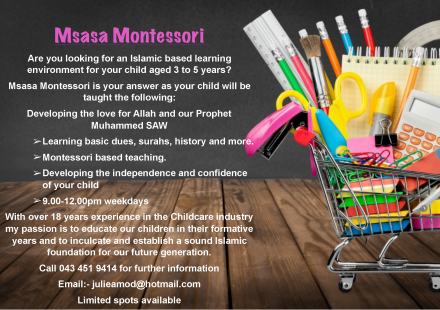 He is very passionate, an excellent deaf role model and a valuable contributor to the deaf Muslim community in the country. Esmail has been recognised and honoured for his brilliant work by the public/private sectors, health and police service and educational establishment. He is believed to be the first deaf entrepreneur ever in the UK, and he�s also been working in partnership with over 10,000 organisations to make a difference in peoples lives. Imran Awan is an Professor of Criminology at Birmingham City University whose public engagement and expertise research on hate crime and Islamophobia is deeply impactful. 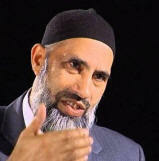 His recent report presented in Parliament examined how non-Muslim British men suffer Islamophobia. His leading research has a public outfacing approach as he uses his work to engage with local Muslim communities. His exhibition on Islamophobia raises awareness of this issue within the grassroots communities. His work continues to provide a much-needed antidote to difficult times in which hate crimes have increased. His work at the Governmental level continues to shape policy and help victims of hate crime. 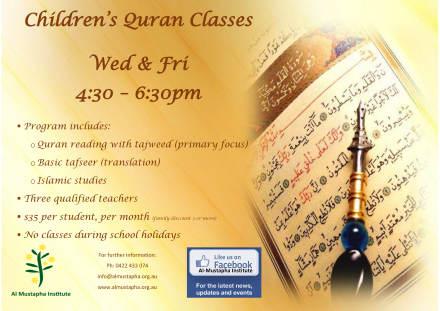 Dr Musharraf Hussain is the compiler of a new Qur�an translation called The Majestic Qur�an. It has been lauded as an excellent translation, revealing the clear message of the Holy Qur�an in plain English language and style. A special feature of this translation is that he has added section headings for the sake of clarity. These headings correspond to major themes and subject matter presented in the text. 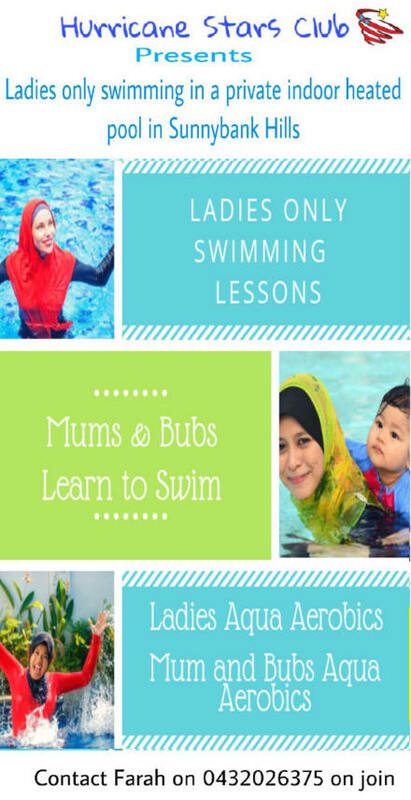 The headings of each section are not just attention-grabbing but reflect its contents, themes and specific topics that help the reader to understand the words of Allah. 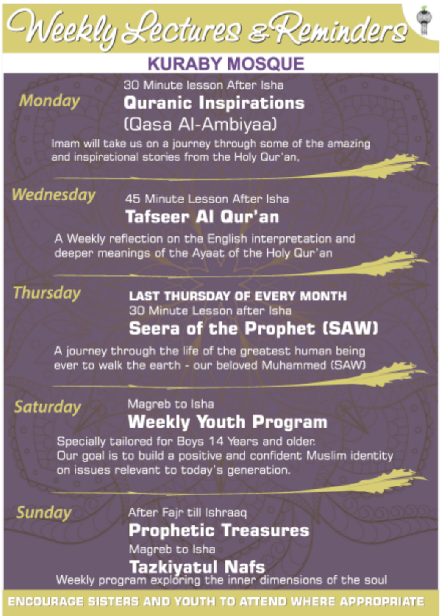 The Majestic Qur�an is a must read for those who want to understand the message and teachings of Islam. 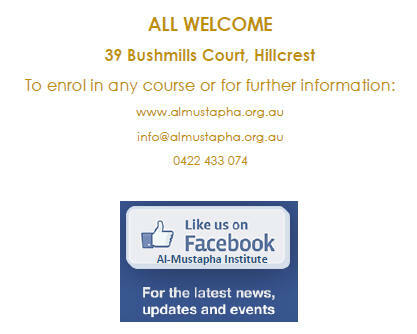 THE EARLY HISTORY OF MICRO AND MESO DIALOGUE BETWEEN MUSLIMS AND NON-MUSLIMS IN AUSTRALIA. 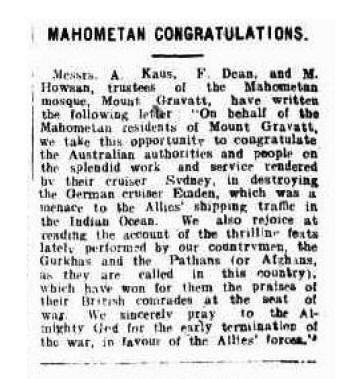 If you look at the long history of Australia, the initial interfaith dialogue between the Yolgnu (and others) and Macassans represented a high point in regional meso level interfaith dialogue. 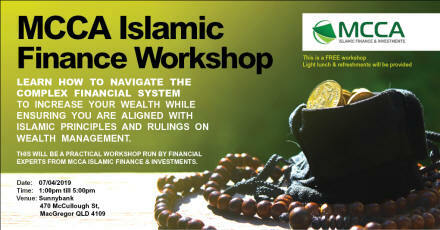 This mirrored the way Islamic traders with their Sufi teachers moved into Indonesia between the 7th and 13th centuries. It seems to have allowed true two-way conversation to have taken place, with mutual respect offered from both sides. Once Australia was colonised, monologue was the rule. White Anglo Saxon Protestant was the preferred hegemony, to the detriment of the Indigenous population and other migrants. This monologue painted anyone outside the required profile as the different other. 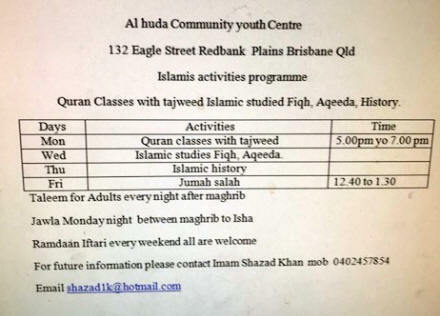 What we see from the public record is a small group of mostly devout Muslims trying to live in a strange country with some even stranger customs. The individuals discussed in this article represent a small portion of the stories available. However, they demonstrate attempts by the early Australian ummato be heard. 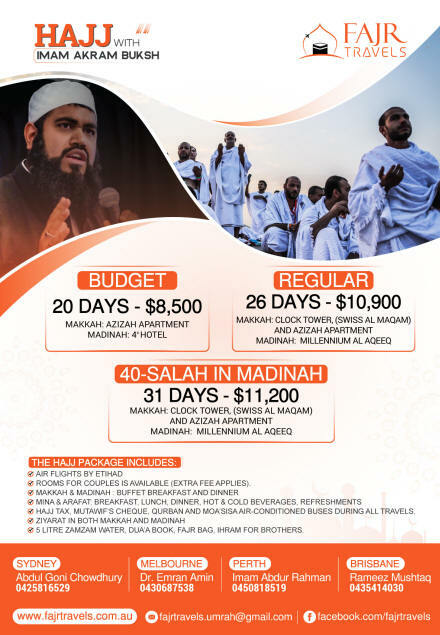 They engaged in a range of individual and community negotiations and used any opportunity to demonstrate their good intent and the nature of their religion. In doing so, they set the scene for the next period and the waves of migration to come after 1945. The legacy of the early Muslim migrants has only recently been written back into history. What is apparent from our past historical writings is not what is there, but what is missing. 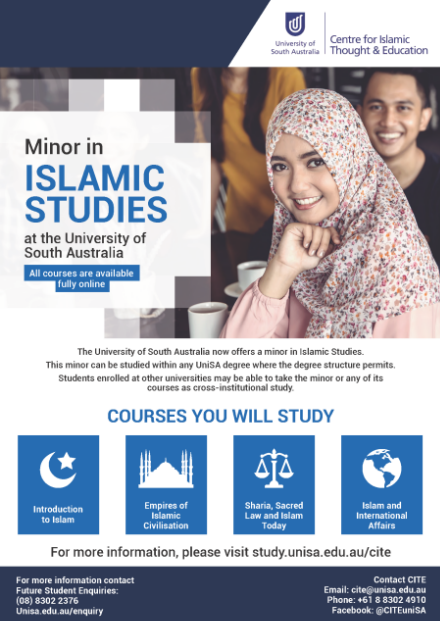 As an example, Manning Clarke�s opus, The Complete History of Australia, make no mention of the Afghans or early Muslim migrants throughout the six volumes, despite their contribution to early infrastructure building. This cannot be seen as the fault of the Afghans, Albanians or other Muslim migrants, many of whom attempted to have their voices heard above the often racist white noise emanating for much of our early colonial history. What is apparent is that, throughout Australian history, dialogue has waxed and waned. It would be disingenuous to talk of this early colonial Islamic dialogue as true interfaith dialogue. Post colonisation, the initial dialogue with non-Christian religions occurred at a micro level. Miners, farmers and squatters probably engaged in dialogue with Afghans and Indians through necessity, despite the colonial narrative emphasising White European�s social superiority. This initial research touched the tip of the iceberg. Further research through private holdings and un-digitised records should enable a more complete exploration of dialogue in the early days of colonial Australia that has led to the establishment of our current range of interfaith dialogue organisations. 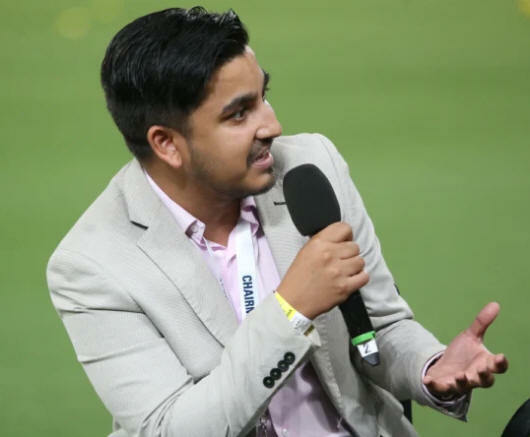 Fahim Khondaker speaking with the Brisbane Lions at the Gabba. 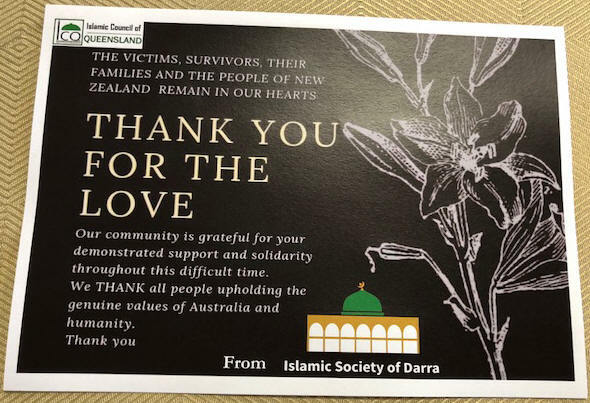 As a Muslim, I have been overwhelmed by the kindness shown towards us since the Christchurch attack and was physically reduced to tears while reflecting on it yesterday. But I cannot blame anyone for thinking that the public sympathy directed towards Muslims in New Zealand and Australia over the last week is now reaching a point of being a little too much. Taking cues from Prime Minister Jacinda Arden and the people of New Zealand, thousands of Australians attended prayer services and vigils to #standtogether in solidarity with the Muslim community. The media ran countless stories with a positive sentiment on Muslims (and hit pause on the relentless negative ones we are all accustomed to). AFL and NRL football clubs including the Brisbane Lions and Brisbane Broncos made significant public statements of support at home games. Kochie did a strangely aggressive interview with Pauline Hanson on Sunrise. 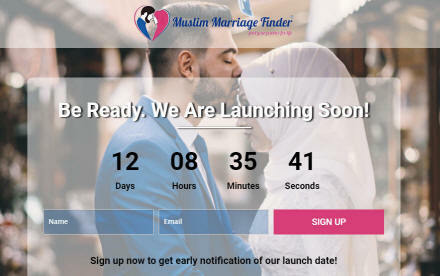 Waleed Aly�s video hit more than 12 million views and Prime Minister Scott Morrison publicly referred to us as his "Muslim brothers and sisters". 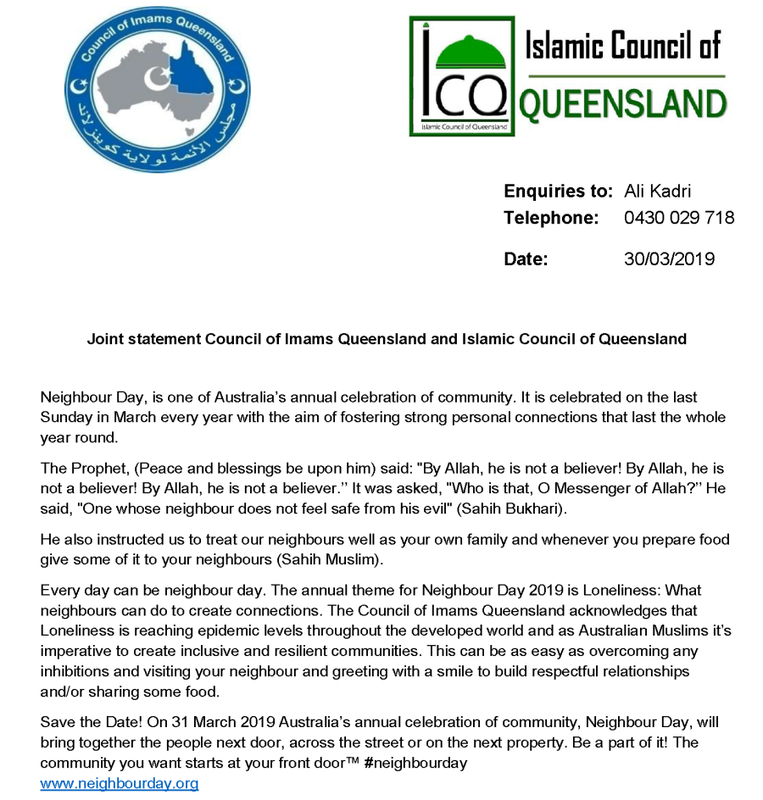 There can be no denying that Muslims, who form a mere 2 per cent of Australia�s population, have been showered with love this week � and for that, I am truly grateful. Many people are now asking whether the Christchurch attack means that everyone has to blindly love Islam and Muslims? Of course not, nobody is seeking that. 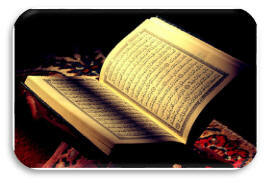 It does not need to allay any fears or criticism of Islam that one may have � people are free to dislike the religion. Do we as Muslims like this? No, but we also understand that people are allowed to be a critic of our religion. All we are hoping for is that people now realise that the manner in which this criticism has been expressed over the past decade has had severe consequences on our mental and physical health � and 51 people lost their lives for it (may they rest in peace). If we were to push the envelope, we would hope that people would make an effort to understand Muslims and Islam better and be accepting of our right to practice it. It is, after all, a religion that is centuries old and features well-known prophets such as Jesus, Moses, Abraham and Noah (peace be upon them). Yet it is misunderstood and frequently misrepresented in 'Western' countries today. Islam shares one thing in common with vaccinations � the internet is flooded with misinformation on the matter. The Christchurch attack has reminded everyone (or in many cases made them realise for the first time) that Muslims are also human and that we can be and are victims of terrorism too. As bad as it sounds, it feels almost as if we have had to go through something this horrific to earn our right to sympathy from many quarters of our society. It didn�t matter that thousands of Muslims lost their lives on 9/11 and the countless other terrorist attacks since. Many Muslims, particularly hijab-wearing women who are easily identifiable as such, have feared for many years that a violent attack on Muslims living in Western countries was inevitable. The dehumanisation of Muslims and the negative rhetoric towards Islam was only ever going to inspire an attack like this. Most of us had internalised this fear given that we were always told that Islamophobia is something we have made up to get ahead in life. We were too small in numbers to take on that battle. We focused, instead, on protecting our children from the hatred as best as we could. 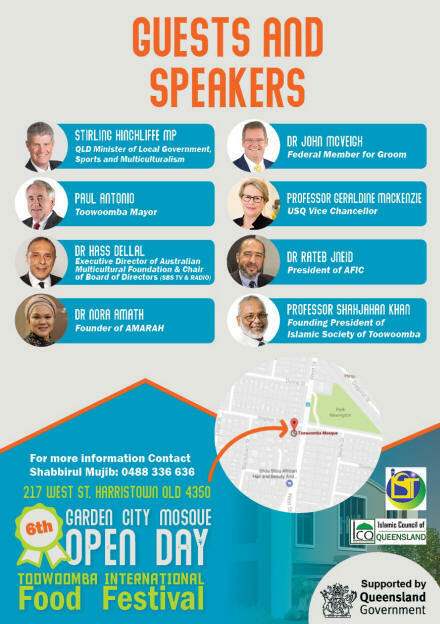 There have been terrorist attacks at mosques in Canada and the UK in recent years, but those attacks didn�t elicit the raw emotional response of the Christchurch massacre. Perhaps it was the brazenness of the alleged attacker or the fact that it was so close to home. Whatever the reason, it has galvanised our society. A line has been crossed and we all agree on that. This week Australians proved that we can all get along and care for one another irrespective of our religious and/or other differences. We proved that we can drown out the voices of the minority who spread hatred among us and give courage to the silent majority to politely speak out against hatred in all its forms whenever and wherever they see it. I have seen many people expressing inclusive views to counter hatred in social media conversations. Before Christchurch, they would have let it be or worse, joined in � their courage gives me hope. As Australians, it is our collective responsibility to ensure that such behaviour is sustainable in the long term. We have an opportunity to seize the momentum and deliver a significant blow to the messages of hatred before they can rise again. March 15, 2019, the date of the Christchurch attack, can be our defining moment as a society if we choose it to be. The great thing is, if we are all involved, we only need to do something very small to have a huge impact. We cannot afford to be complacent about this, our future and that of our children depends on it. Senator Jordon Steele-John sums up the problem with Australian politics. ScoMo: Where the bloody hell were ya? A well organised group of Muslims in Queensland... c.1914. These expressions of loyalty were not uncommon and a number of young men from the Muslim community would enlist to fight in both world wars. 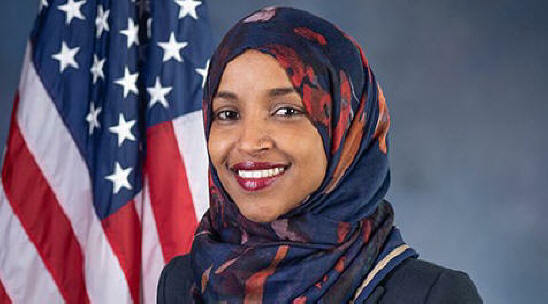 TOPIC: "Lessons of Genuine Faith and Herodom"
US: House of Representatives Speaker, Nancy Pelosi, finally backed Minnesota Congresswoman Ilhan Omar from accusations of anti-Semitism following the uproar against her remarks on the influence of Israel lobby on US lawmakers. �I feel confident that her words were not based on any anti-Semitic attitude,� said Pelosi on March 7 almost a month after the freshman lawmaker faced a barrage of Islamophobic and racist hate for questioning the uncritical support that many members of Congress give Israel�s increasingly hardline, right-wing Government. 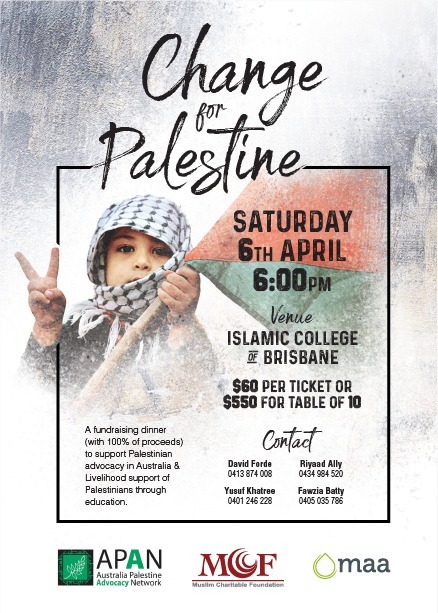 On February 11, Democrat leaders criticised Omar � one of two Muslim congresswomen � for tweets that implied that money spent by pro-Israel lobbying organisations, such as the American Israel Public Affairs Committee (AIPAC), was fueling American politicians� support of Israel. Omar issued an apology the next day, stating, �I am grateful for Jewish allies and colleagues who are educating me on the painful history of anti-Semitic tropes�, however, she insisted she is reaffirming �the problematic role of lobbyists in our politics, whether it be AIPAC, the NRA or the fossil fuel industry�. Omar has been subject to a series of Islamophobic hate and death threats. On March 1, the West Virginia Republican Party held �WV GOP Day,� an event to celebrate the Republican Party, at the West Virginia Capitol. An exhibitor displayed a poster at the event falsely connecting Omar to the 9/11 terrorist attacks, along with Islamophobic flyers. Omar pointed to the poster as an example of why she is targeted with violence, also citing white nationalist domestic terrorist Christopher Hasson placing her on his hit list and �Assassinate Ilhan Omar� being written in a Minnesota gas station. Central Synagogue is a historic Reform Jewish congregation located in midtown Manhattan. 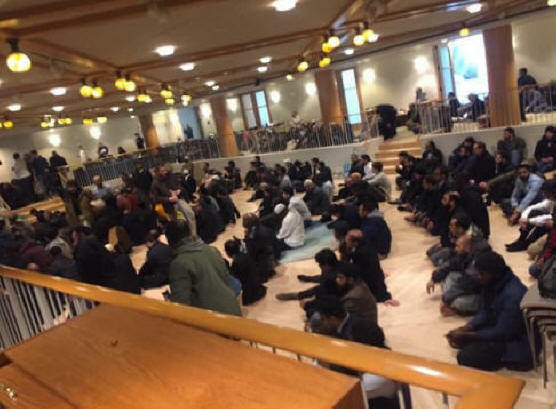 US: When a New York mosque discovered that a fire had rendered their worship space unusable for Friday prayers, a neighboring Reform Jewish congregation jumped into action ― inviting the Muslims to pray inside their synagogue. 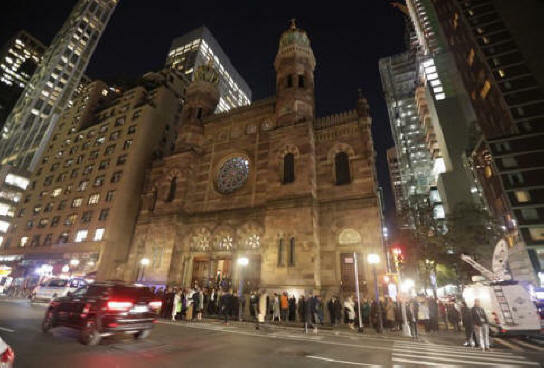 The spontaneous, last-minute invitation resulted in a profound moment of interfaith solidarity at New York City�s historic Central Synagogue, senior cantor Daniel Mutlu told HuffPost. �We talk a lot about the unity of people and the unity of love and that was so apparent on that day,� Mutlu said. Mutlu said he and other clergy and members of Central Synagogue gathered outside the Islamic Society of Mid-Manhattan last Friday afternoon to show support for local Muslims in light of New Zealand�s mosque massacres. 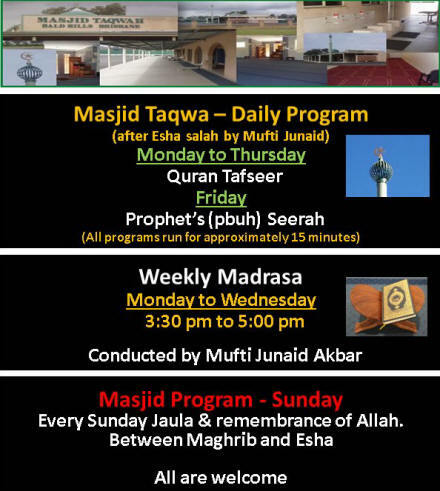 The March 15 shootings at two Christchurch mosques killed 50 people and injured dozens of others. 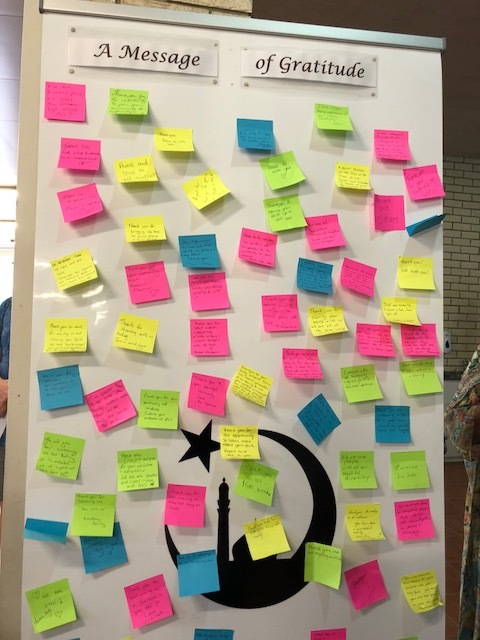 The attacks, which occurred during weekly congregational prayer services, left many American Muslims anxious about security at their own mosques and Islamic institutions. Congregants arrived at the Islamic Society of Mid-Manhattan on Friday afternoon to participate in the weekly prayer service and grieve together on the one-week anniversary of the attacks. But a fire in a restaurant located underneath the mosque on Wednesday damaged the worship space, NBC 4 New York reported. The congregation�s imam was hoping inspectors would determine it was safe enough for people to enter on Friday, Mutlu said. It soon became clear that they would not be able to worship in their usual building. After realizing the swelling crowd of worshippers could be turned away, a rabbi from Central Synagogue told the imam that the Muslims were welcome to worship inside its building, about a block away, Mutlu said. The imam accepted the offer and the rabbis led the Muslim congregation down the street to doors of the synagogue. Muslims from the Islamic Society of Mid-Manhattan worshipping inside Central Synagogue. 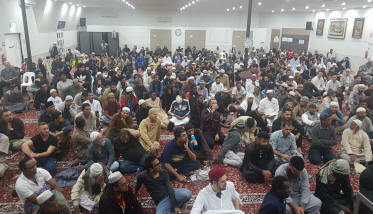 Ultimately, Mutlu estimates close to 600 Muslims packed into the synagogue�s Pavilion event space to worship on Friday. The worshippers took their shoes off and sat in rows on the floor, facing Mecca, he said. The imam later led his congregation in a call and response, in which members enthusiastically prayed for blessings on the synagogue and its rabbis. Mutlu said it was an �incredible sight� that illustrated to him that even though there are differences in the ways that Jews and Muslims pray, there are many more things that unite these two religious groups. 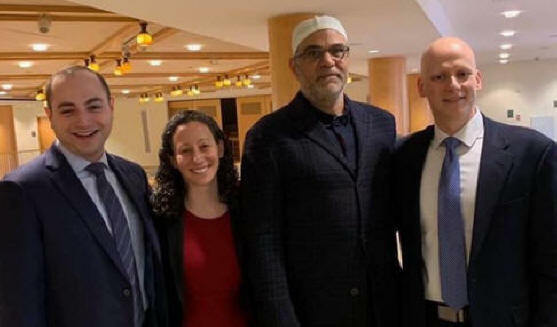 From left) Rabbi Ari Lorge, Rabbi Stephanie Kolin, Imam Ahmed Dewidar and Cantor Daniel Mutlu pose for a photograph at Central Synagogue. 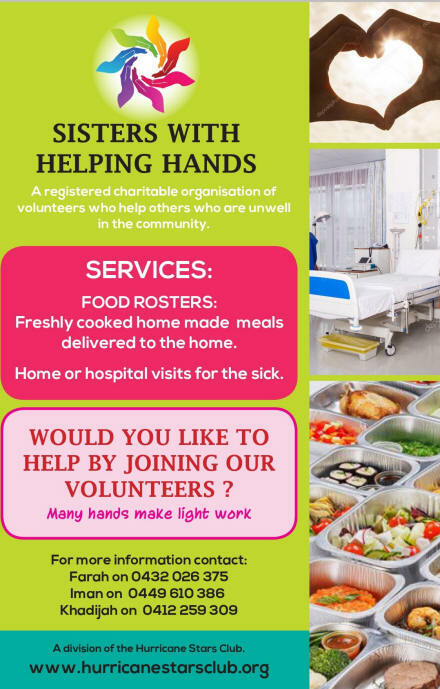 �What it meant to us is that we need to lean into love and focus on what we share, focus on really taking care of each other,� he said about the service. �These are the stories we should uplift, these are the moments where we truly find out who our neighbours are,� he said. US: The House of Representatives overwhelmingly passed a resolution Thursday condemning anti-Semitism, anti-Muslim discrimination, white supremacy and other forms of hate, following a week of debate among congressional Democrats. The controversy began after some lawmakers accused Democratic Congressmember Ilhan Omar of invoking anti-Semitic tropes while questioning U.S. foreign policy on Israel. The House leadership initially drafted a resolution condemning anti-Semitism in what was seen as a direct rebuke of Omar. But many progressive Democrats said Omar, one of the first two Muslim Congresswoman in U.S. history, was unfairly being singled out. The split within the Democratic Party forced the leadership to withdraw its initial resolution and then present a much broader one. Congressmember Ilhan Omar voted for and praised the new resolution in a joint statement with fellow Muslim lawmakers Rashida Tlaib of Michigan and Andr� Carson of Indiana. Layla's mind goes a million miles a minute, so does her mouth � unfortunately her better judgement can take a while to catch up! Although she believes she was justified for doing what she did, a suspension certainly isn't the way she would have wished to begin her time at her fancy new high school. Despite the setback, Layla's determined to show everyone that she does deserve her scholarship and sets her sights on winning a big invention competition. But where to begin? 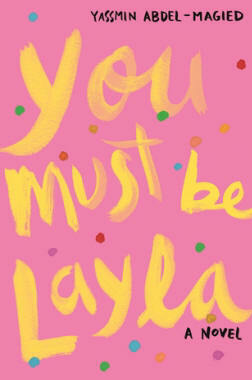 Jam-packed with heart and humour You Must Be Layla by Yassmin Abdel-Magied reveals a powerful new voice in children�s writing. Touching on the migrant experience and exploring thought-provoking themes relevant to all teens, this book shows the strength required to be a Queen with a capital �Q�. KB says: A secret to really moist cakes is to place an oven resistant bowl (I use a ramekin) of water in your oven when baking as it will keep the cake moist. Beat all the ingredients together for 4 mins pour into deep greased loaf pan or bundth tin and bake in a preheated 175 degree oven for approx. 30mins. 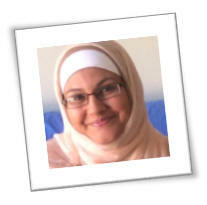 Q: Dear Kareema, how can I burn more kilojoules during my treadmill run? A: You�ll find that outdoor running is more challenging and typically burns more kilojoules than slogging away on your treadmill. So mix up your running routine to get the most out of each run. Alternate between your incline and speed to get out of your comfort zone and spike your heart rate. Try interval-training where you sprint for 30 secs and then recover by walking for 30 secs � repeat. Another fun idea is to alternate treadmill sprints with body weight exercises. Sprint for 30 secs, hop off and do some lunges, squats, push-ups, etc., and get back on the treadmill for more sprints. Pause for a few seconds and reflect upon your life. Ask yourself some tough questions. Most times people ask themselves questions that are focussed on material enrichment, for example, how much money do I have? Is it enough? Should I get another degree to get a better job? Am I earning enough? Should I stop renting and buy a house to keep up with societal expectations, even if that means paying riba to the bank? Should I buy this or buy that? These are actually what I call the �band-aid questions�. Answering these band aid questions will merely cover the deep, unaddressed yearnings of life and keep you enslaved to objects. So, how about you ask yourself the real questions that will open your mind and let you enrich your life with spiritual abundance? Questions like, are you satisfied with how you are responding to circumstances? Are you content with your behaviours? Are you in complete submission to your Creator? Are you a better individual today than you were yesterday? These tough questions require immense self-reflection and not everybody is ready to confront the revelations that come about from self-reflection. The best part about self-reflection is that you will not only experience a breakthrough in terms of finding crystal clarity about all the things that may be unclear with your life presently but you will also become so much closer to ALLAH. Enrichment of life comes through self-reflection, followed by self-transformation into a better person, a more enlightened being, who responds to situations with absolute faith and submission to the flow of the Creator�s plans. A being who fully accepts that this life is temporary therefore all accumulated material objects is also temporary and meaningless. 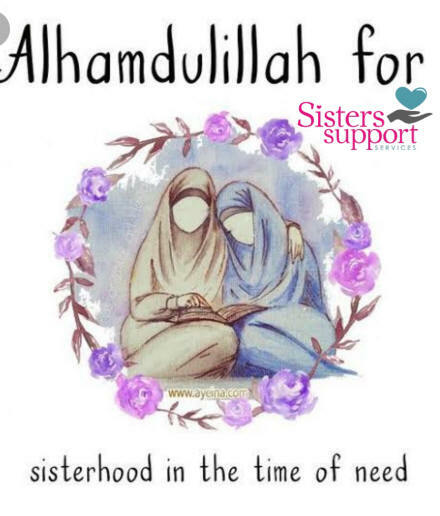 A being who appreciates and expresses gratitude to ALLAH rather than complains and compares about their life based on other peoples� meaningless material possessions or social status. A being who understands that solutions to life�s challenges, such as, marriage, family, workplace, national politics, and so on, come not from intimidation and retaliation but from respect and understanding and from a consistent daily practice of peace and kindness to self and others. Understanding where you are today and examining how you arrived at that place in your life will help you understand what you really want. Take each of the four primary areas of your life and examine them. 1. How do I feel in my physical health? 3. How do feel in my mental health? 4. Why do I feel this way? 5. How do I want to feel in my overall health? 6. What can I do right now to achieve my health goals? 1. How do I feel in my relationships? 2. Why do I feel this way about my relationships? 3. Who are the people that bring out the best in me? 4. Who are the people who trigger negativity in me? 5. What do I need to do to enhance my relationship with positive people and minimise my relationship with negative people? 1. How often am I connecting with ALLAH in silence? 2. How do I feel when I connect with ALLAH? 3. 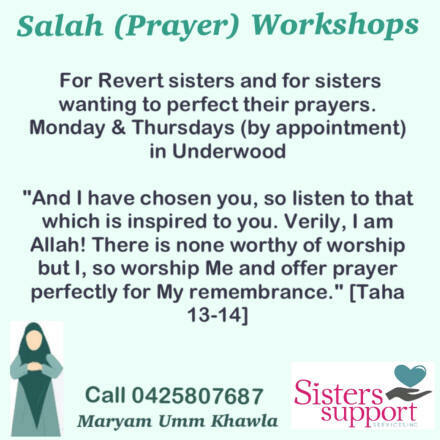 What can I do right now to connect more with ALLAH? 4. How am I being of service to my community? 5. 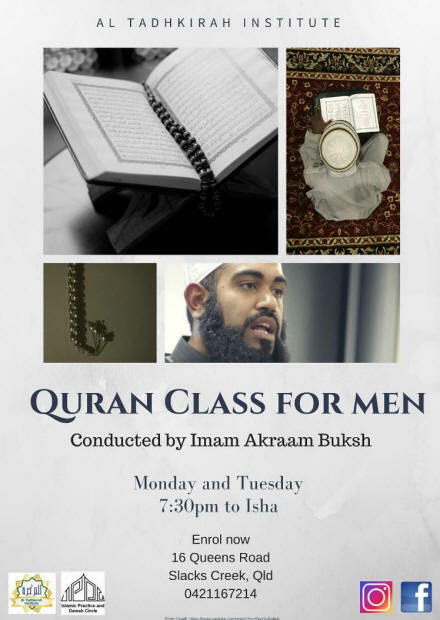 How do I feel about the way I practise Islam? 6. What can I do to become a better person today than the person I was yesterday? 1. 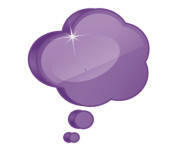 Is what I do for work or in my business fulfilling me? 2. How do I feel about my work/ business? 3. Why do I feel this way? 4. What does my ideal job/ business look like if I visualised it in my mind right now? 5. What can I do right now to start the process of attaining this ideal job/ business? A very beautiful woman enters the Jallalludin's shop and asks him if the shop belongs to him. "Yes of course, it's my shop! And this is the smallest! I have 3 others! I also have 5 cars and 10 massive houses. And I have billions of dirhams in my account. 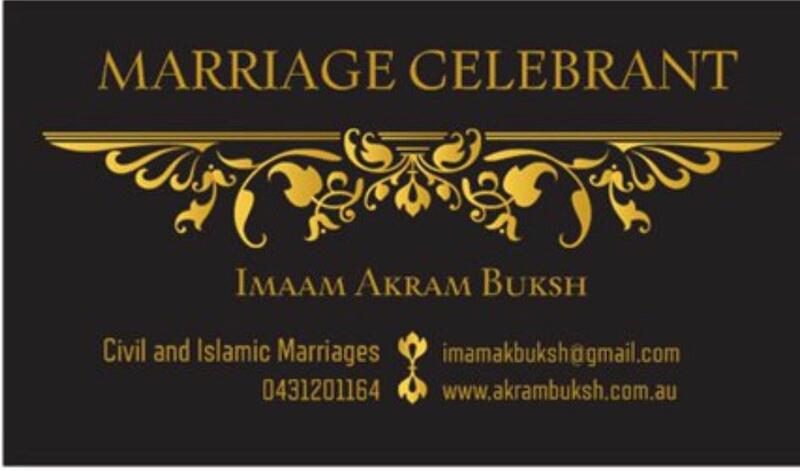 And best of all, I am free and I can get married again." "I'm delighted! My name is Fatima Jallo, Tax Officer". Jallalludin quickly replied: "I'm the biggest liar in the neighbourhood, you can ask all my friends and neighbours. Wallahi, I am a very big liar!!!" Many are the Jinns and men We have made for Hell: they have hearts wherewith they understand not, eyes wherewith they see not, and ears wherewith they hear not. They are like cattle, - nay more misguided: for they are heedless (of warning). it is antithetical to the values which underpin democracy. 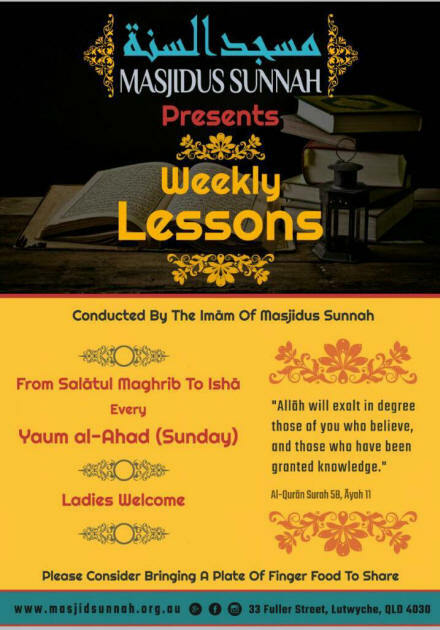 Yassen Khatam, Lecture, Naat and Salawaat un Nabi. 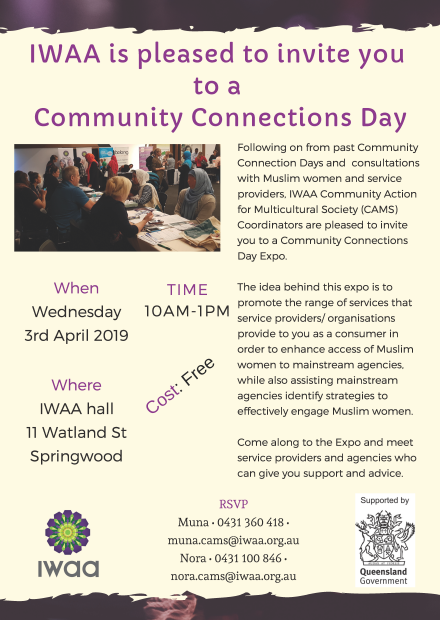 The idea behind this expo is to promote the range of services that service providers/ organisations provide to you as a consumer in order to enhance access of Muslim women to mainstream agencies, while also assisting mainstream agencies identify strategies to effectively engage Muslim women. 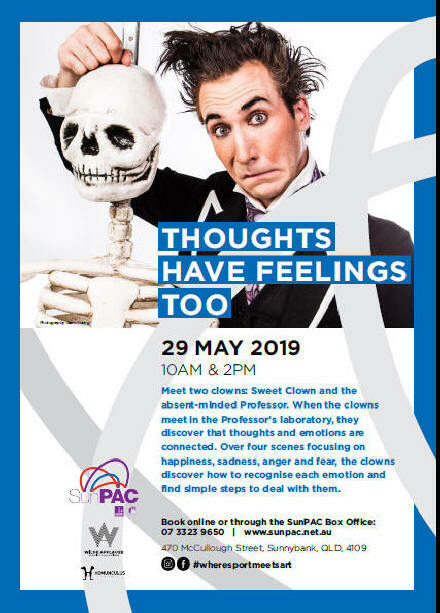 Come along to the Expo and meet service providers and agencies (such as Centrelink, TAFE, Australian Taxation Office, Office of Fair Trade, etc) who can give you support and advice. 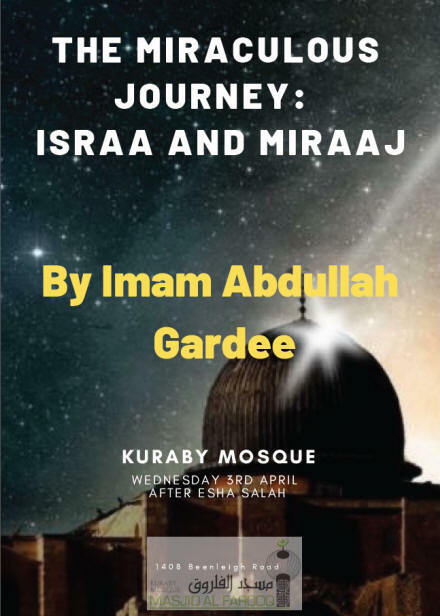 This is a free event, so come along and bring your family and friends.